These aren’t the kind of cookies that you bake and form into shapes suitable for ornaments or making gingerbread houses. 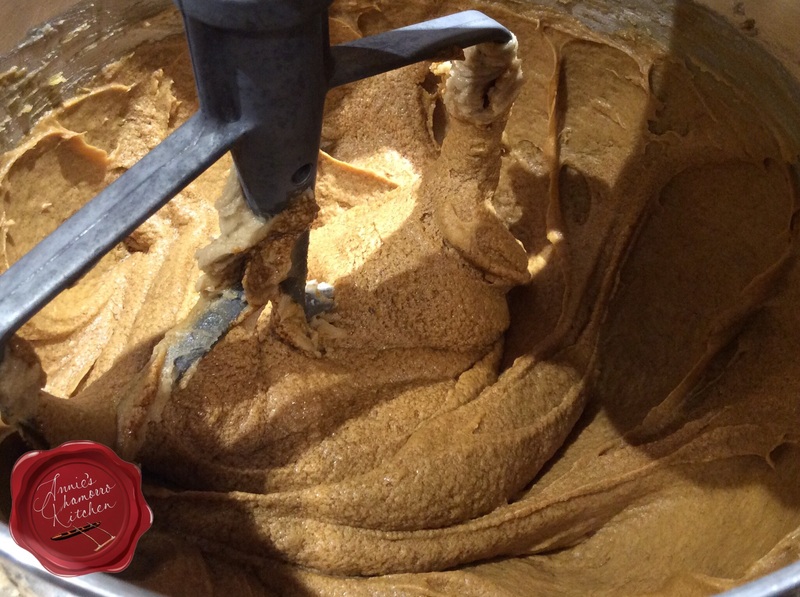 In fact, this dough cannot be rolled out like traditional gingerbread. Rather, the dough is soft and moist (and actually requires chilling in order to handle it better), and the cookies bake up super fluffy, soft, and chewy. 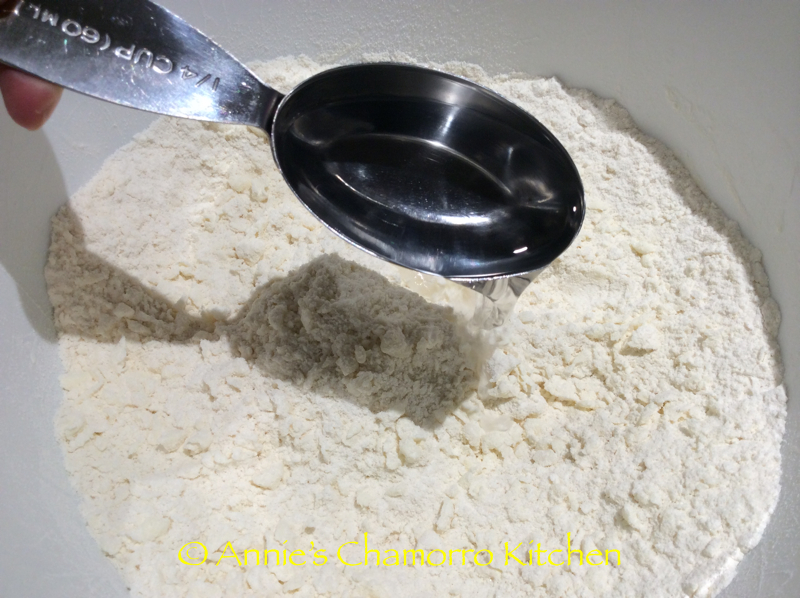 Start by placing the flour into a medium sized mixing bowl. 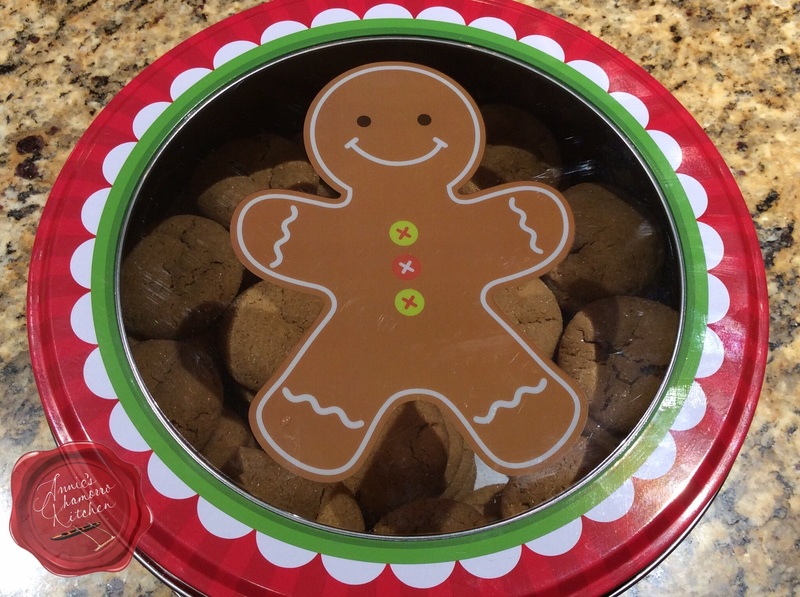 Now for the heart and soul of these incredible gingerbread cookies. 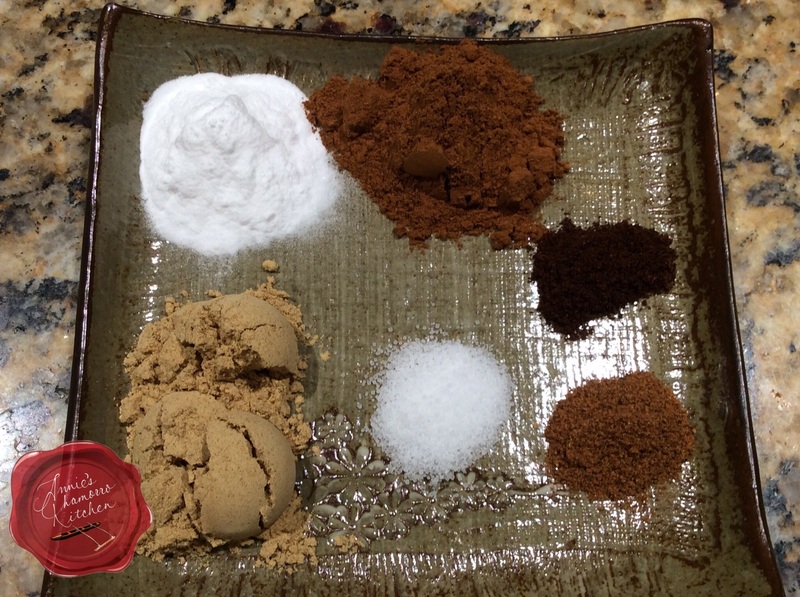 You’ll need baking soda, cinnamon, ground cloves, nutmeg, salt and ginger. Even before the cookies bake, the aroma of these spices make you think of fall and Thanksgiving, and all that comes with holiday baking. Mix the spices with the flour. I use a whisk to really mix it all together. You don’t want any of the seasonings to clump together when you mix it with the wet ingredients. Set this flour mixture aside for now. 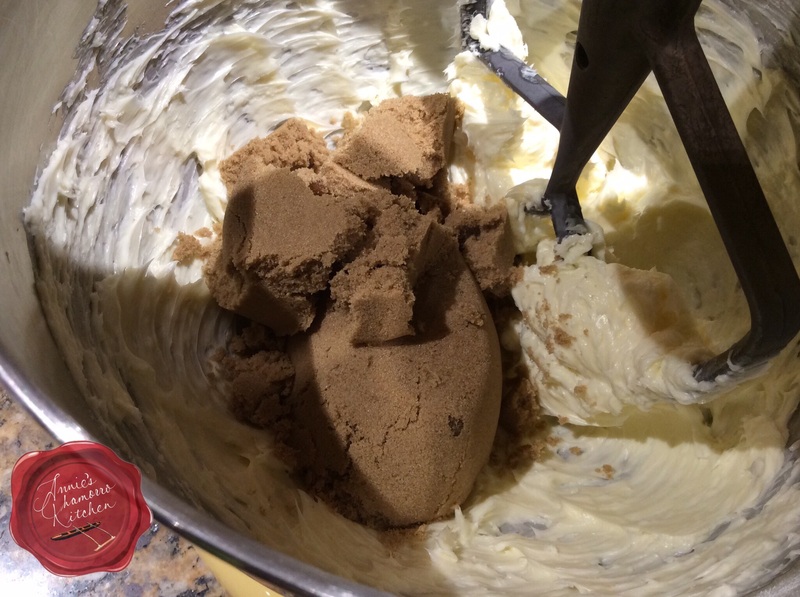 Place the softened butter in a large mixing bowl. 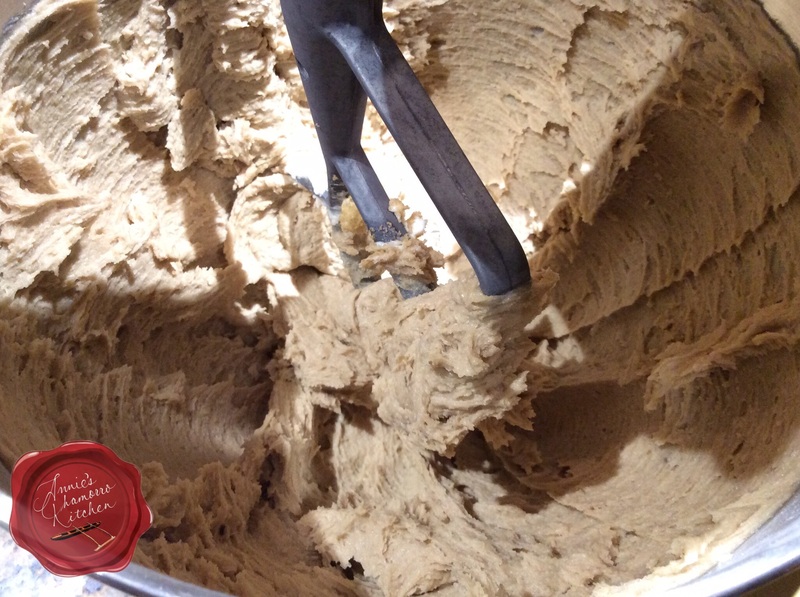 I use a stand mixer because this makes a lot of cookie dough, but you can use a hand mixer as well. Add the brown sugar to the mixing bowl. This is a great mixture to spread over hot dinner rolls, by the way. Just add a teaspoon of ground cinnamon and voila! Sweet Cinnamon Butter! Now I want to make some dinner rolls, but I digress. 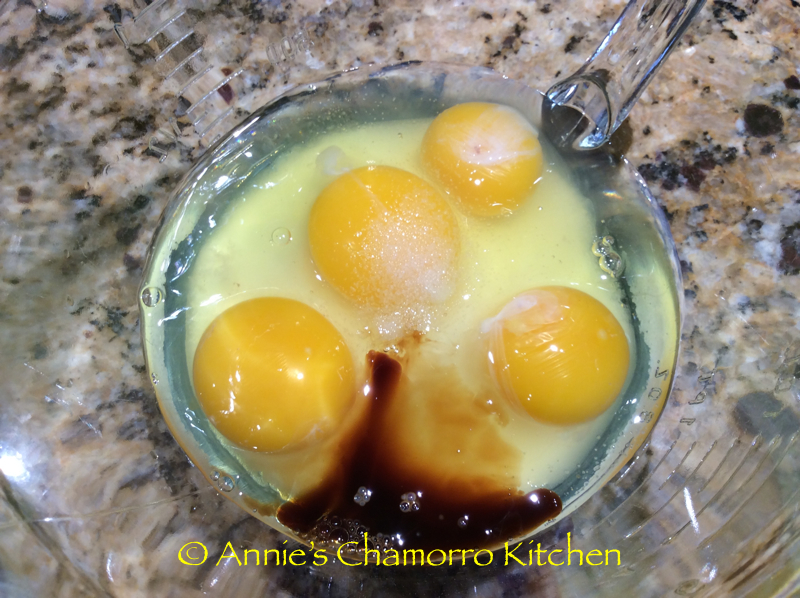 Add the molasses, eggs and vanilla extract to the mixing bowl. Mix on low speed for a minute or so, or until you get a nice creamy consistency like what’s pictured below. Scrape down the sides of the bowl if you need to then mix again. Add the flour mixture, one cup at a time, mixing on low speed just until the flour mixture is incorporated into the wet batter. Continue mixing in the dry ingredients, a cup at a time, until a dough forms. 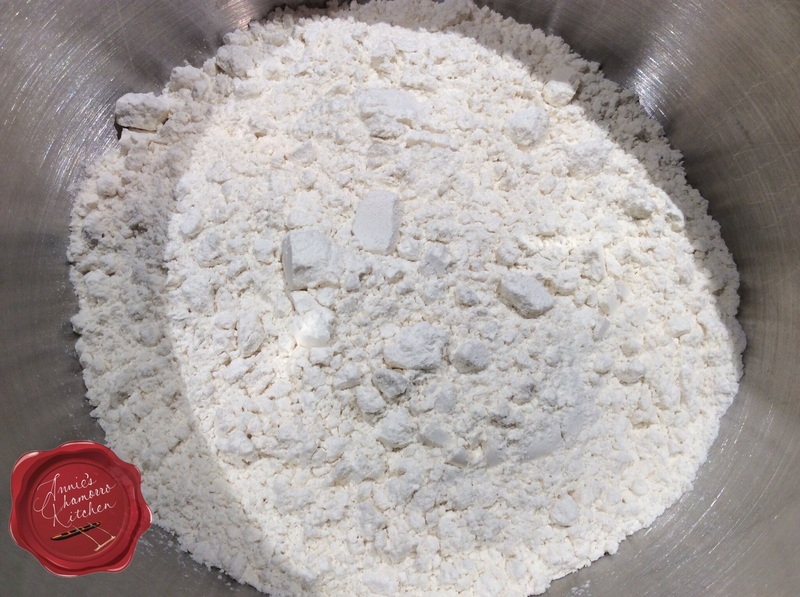 Stop mixing when you no longer see clumps of dry ingredients. 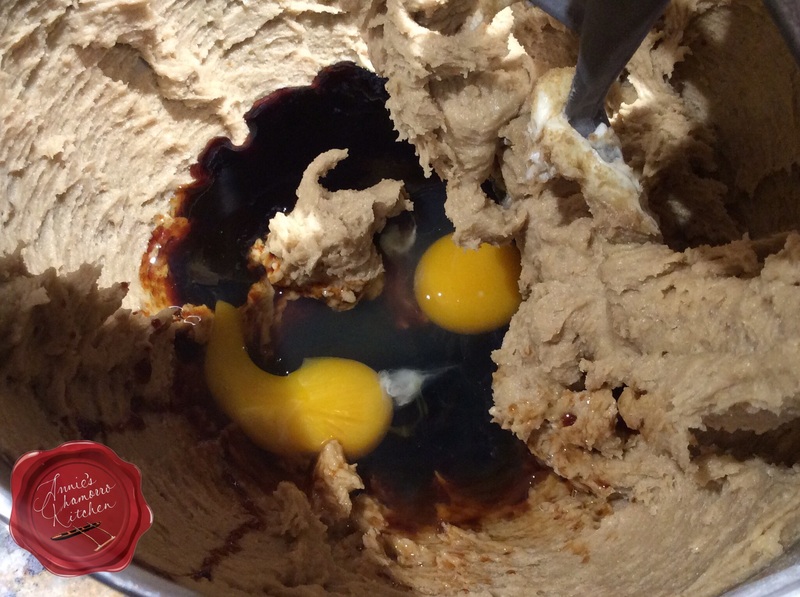 Do not over mix the dough. Because this is a really wet dough, you need to chill it for several hours before making dough balls. I usually prepare the dough while dinner is cooking, then I pop the mixing bowl into the freezer while we eat dinner. After dinner, I take the dough out of the freezer and bake the cookies. 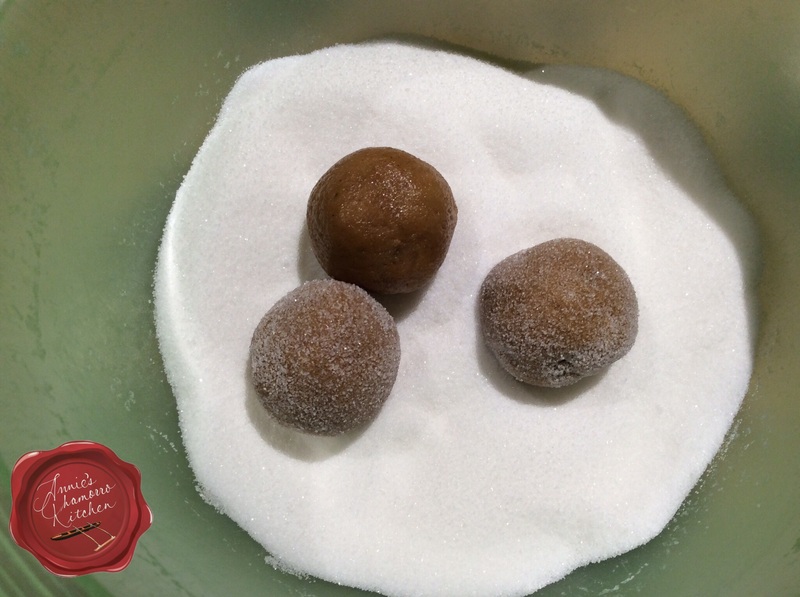 Roll the balls of dough in a bowl of granulated sugar. Ensure the entire ball is well-coated with sugar. Place each ball of dough onto a baking pan. If you have regular baking pans, make sure to line the pan with parchment paper first. I use stoneware pans; there is no need to line them with parchment paper. Place the balls about 1 1/2 to 2 inches apart. These cookies will spread, but they won’t spread too much. Bake the cookies for 10 minutes. Let the cookies cool on the pan for a couple of minutes then remove them to a wire rack to finish cooling completely. See how nicely they puff up? As the cookies cool, they will settle just a little bit, but they will still be a bit puffy, and they will most definitely be soft and chewy. Here’s my complete recipe. I think you’ll really like this one. ENJOY! 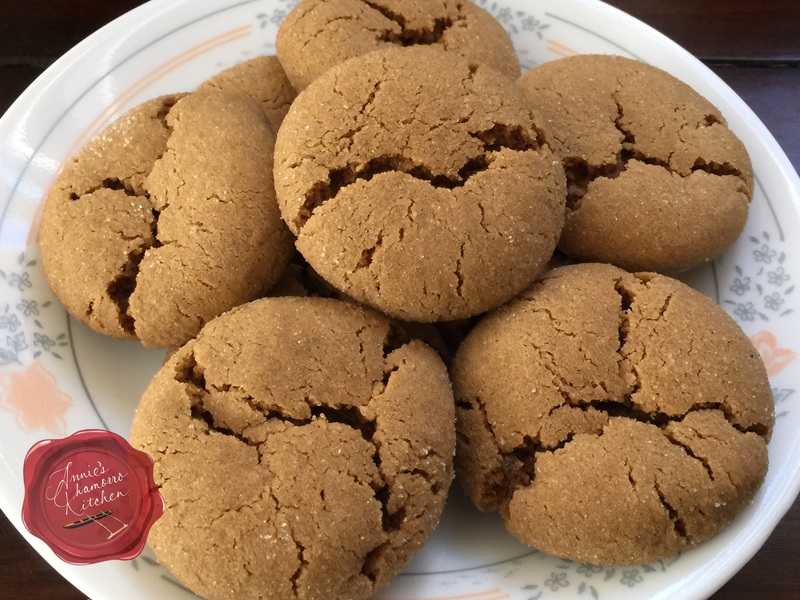 SOFT & CHEWY gingerbread cookies that make you think of Thanksgiving and the holidays, all year round. 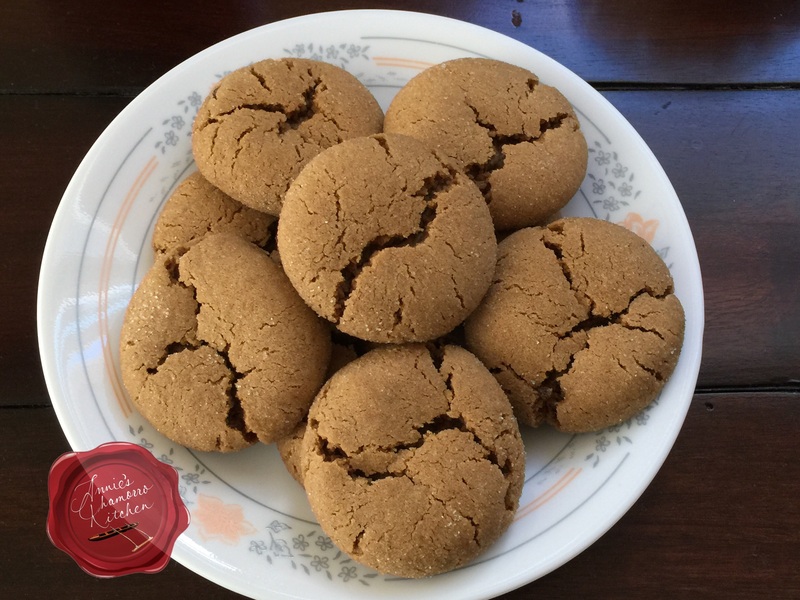 These are NOT at all like the typical rock-hard gingersnap cookies. 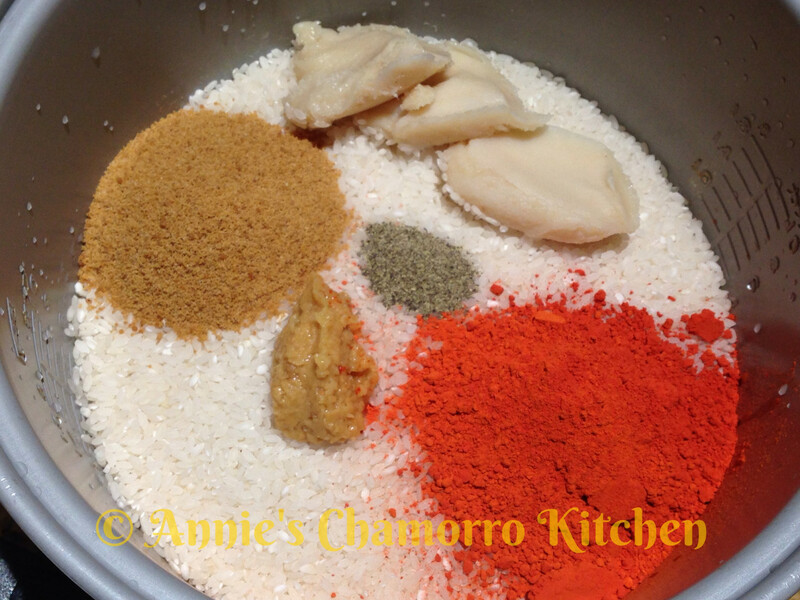 In a medium sized bowl, place the flour, baking soda, cinnamon, cloves, nutmeg, salt, and ginger. Whisk to combine all the dry ingredients then set aside. 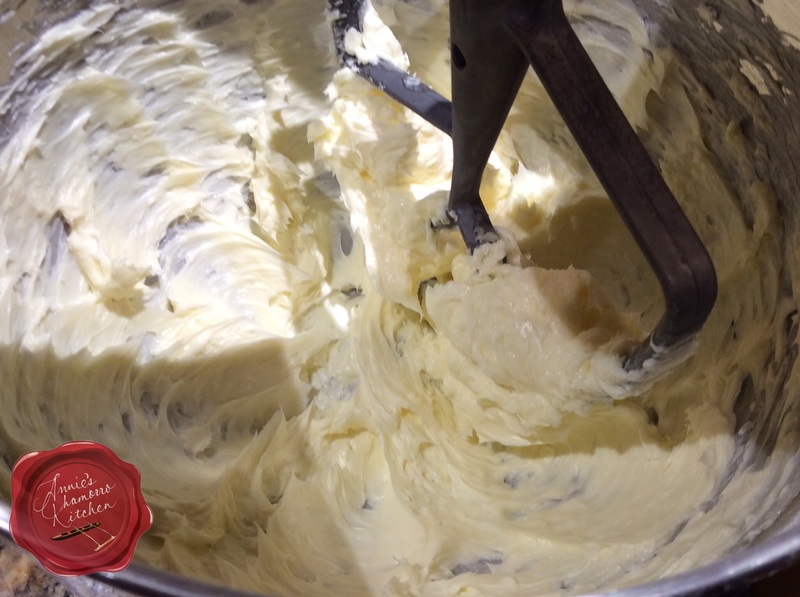 Place the butter in a large mixing bowl. 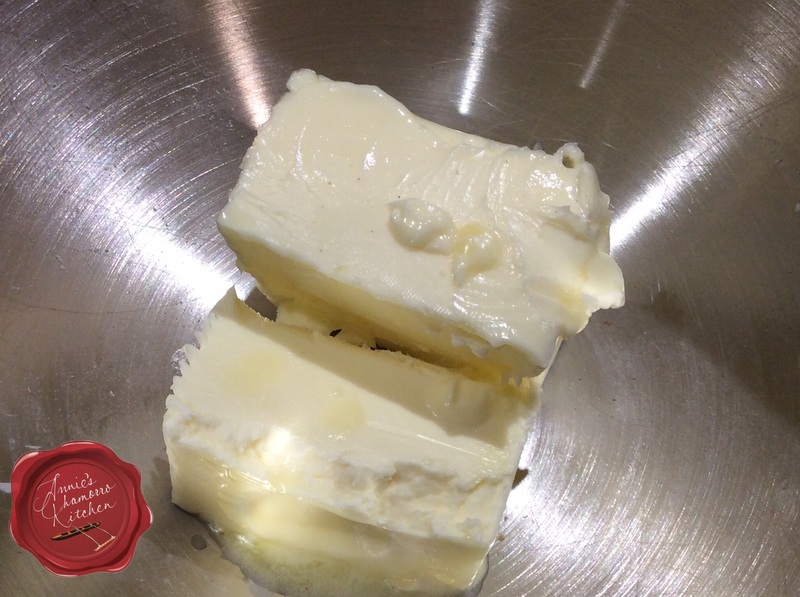 Using a stand or handheld mixer, beat the butter until creamy. Add the brown sugar to the creamed butter. Mix until fluffy. Add the molasses, eggs and vanilla extract to the butter-sugar mixture. Mix until well incorporated. Scrape down the sides if required and mix again. Mix the dry ingredients, one cup at a time, with the butter mixture. Stop mixing once the last bit of the dry ingredients are mixed into the dough (do not over mix). Scoop out some chilled dough and roll into a ball. I use a small cookie scoop that holds 1½ tablespoons. 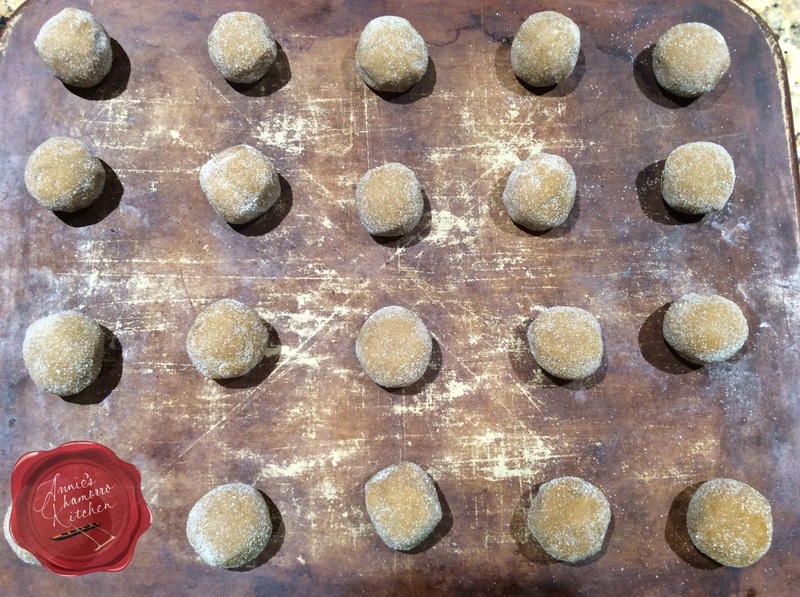 Roll each ball of dough in the granulated sugar, coating the entire ball. Place the coated balls onto a parchment paper lined baking sheet (if you use a stoneware pan you don't need to line it), about 1½ inches apart. These cookies will spread only a little, so you don't need to space them too far apart. Bake in a preheated 350 degree oven for 10 minutes. Let the cookies cool on the pan for a couple of minutes then remove to a wire rack to finish cooling. These cookies are soft and chewy, and will stay soft for several days (if they last that long!) when stored in an airtight container. 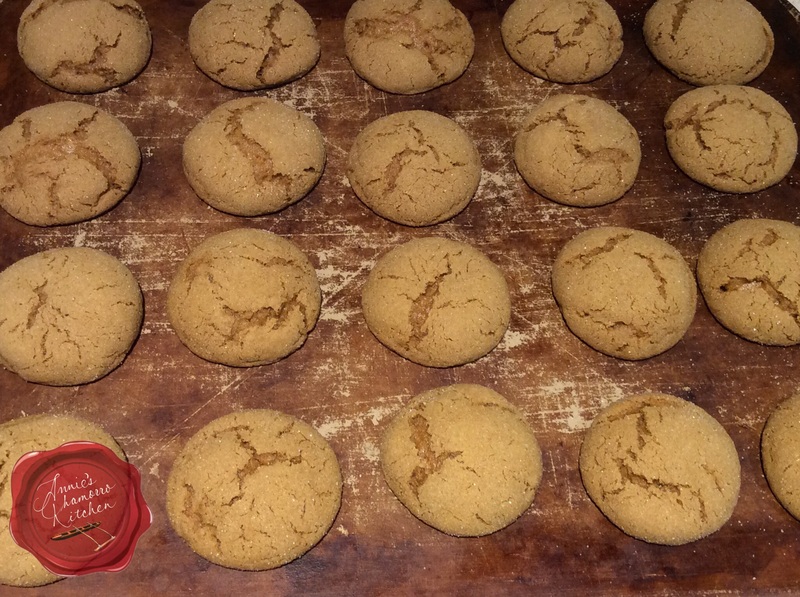 This recipe makes about 6 dozen small cookies. 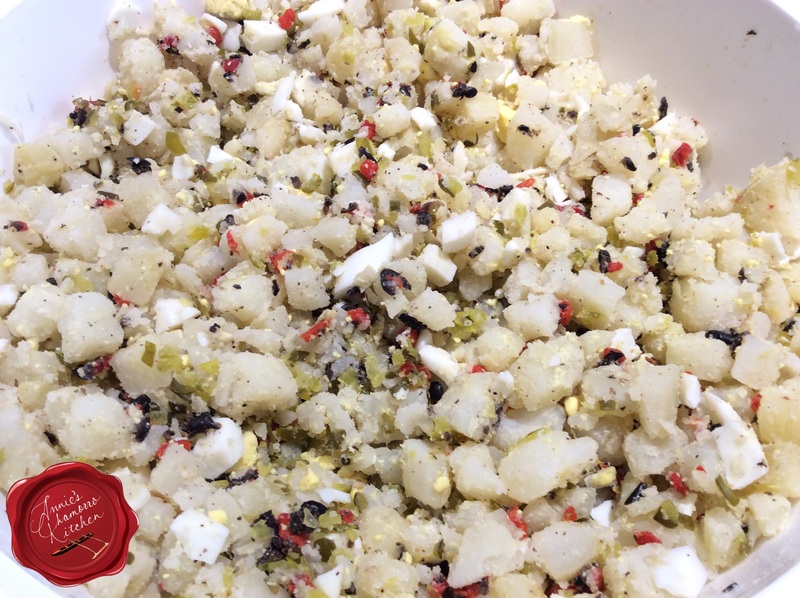 Chamorro Potato Salad is a must-have at any Chamorro gathering. 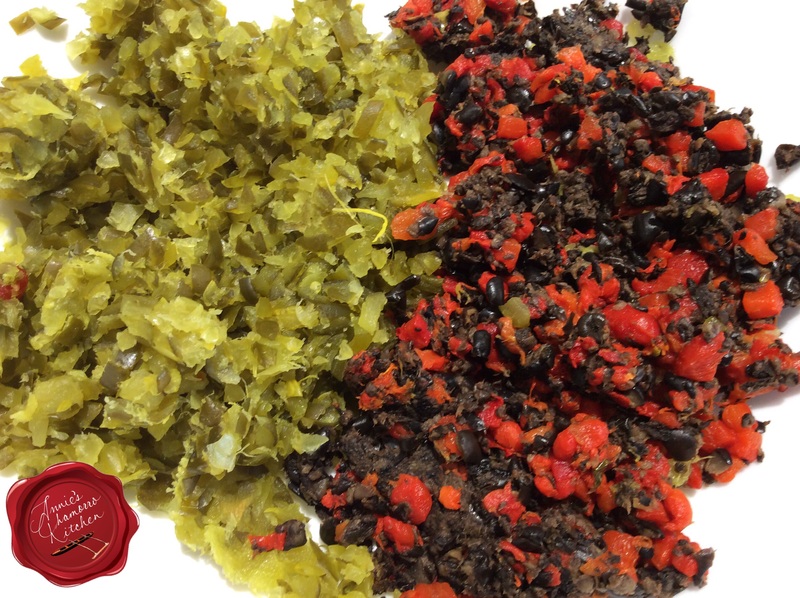 Your fiesta menu would not be complete without it. 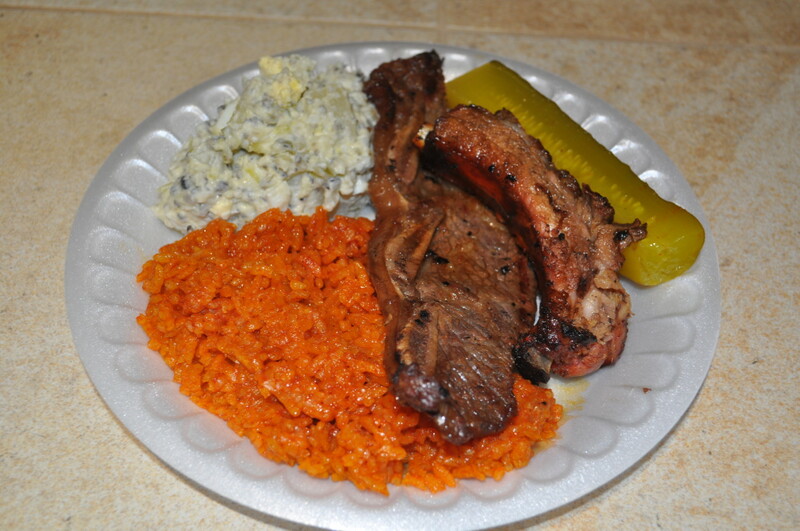 There are several variations to this classic side dish, but Chamorros pretty much make it the same basic way. 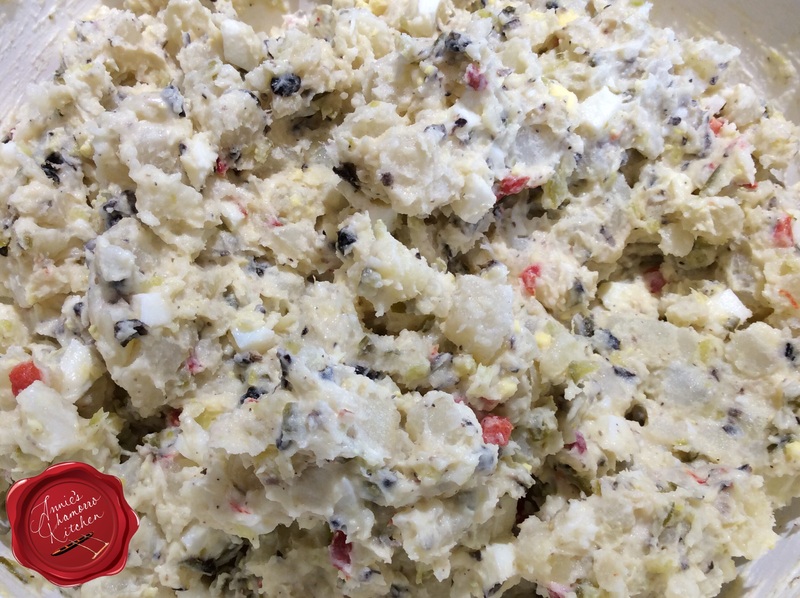 We use potatoes (of course) — any kind good for baking, but russets are most common — eggs, black olives, pimentos, sweet pickle relish and mayo (more on this later). Some people add other vegetables such as celery, carrots, or freshly diced pickles, but I like mine with just the ingredients I listed above. I like a lot of eggs in my salad. I usually add anywhere between 8 and 12 eggs for 5 pounds of potatoes. When I was little, before I knew what I was missing, I would get my mom and sisters to pick out all of the eggs from their potato salad and give it to me — that was all I’d eat out of it, just the eggs. Now I know better and eat it ALL. It’s so good. Start by squeezing out as much liquid from the relish, pimentos and olives. If you don’t squeeze out as much liquid as possible, your salad will be wet and runny, not to mention died the color of the olives, pimentos and relish. You can dump out all of the contents into a fine-mesh strainer, and using the back of a large spoon, press out as much liquid as possible. I managed to press out about 3/4 cup of liquid from the relish, and that was BEFORE I used a cloth to really get the liquid out (see more about this technique below). 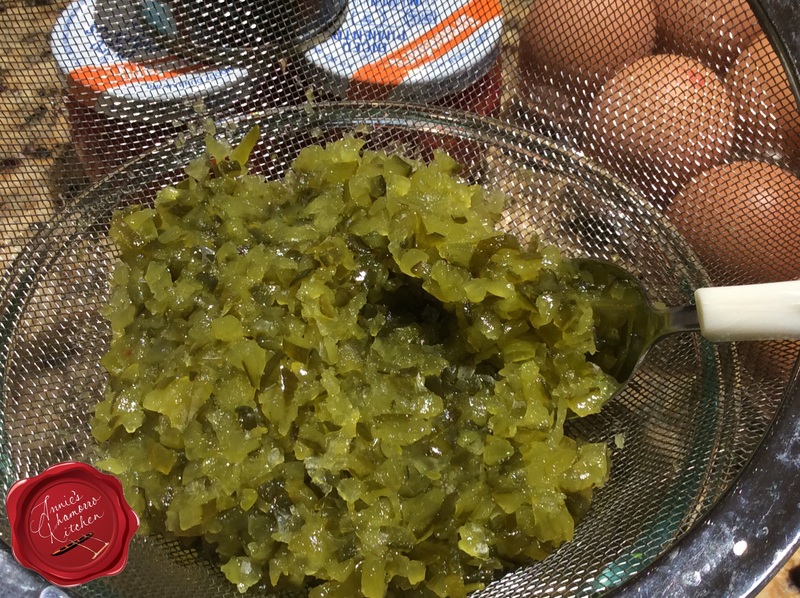 Another option — which is my preferred method — is to place all of the wet ingredients into the center of a clean cheesecloth or kitchen rag (don’t use towel-like cloths or you’re likely to get strings of fabric into your salad). Gather the edges of the cloth together, twisting at the top to compress the ingredients. Squeeze the balled up portion to get out as much liquid as you can. Keep squeezing until no more (or very little) liquid extrudes through the cloth. Set the relish, pimentos and olives aside. Meanwhile, rinse the potatoes and place them into a large pot of hot water. Add the eggs to the pot. Bring the water to a boil. Cook the eggs (in the boiling water) for 10-12 minutes then remove them from the pot. Keep cooking the potatoes until they are done (insert a butter knife or metal skewer into the center of a potato — if it slides in smoothly and easily, the potatoes are done). Remove the potatoes from the boiling water. If you let cooked potatoes sit in water for too long, they soak up too much water, becoming mushy. 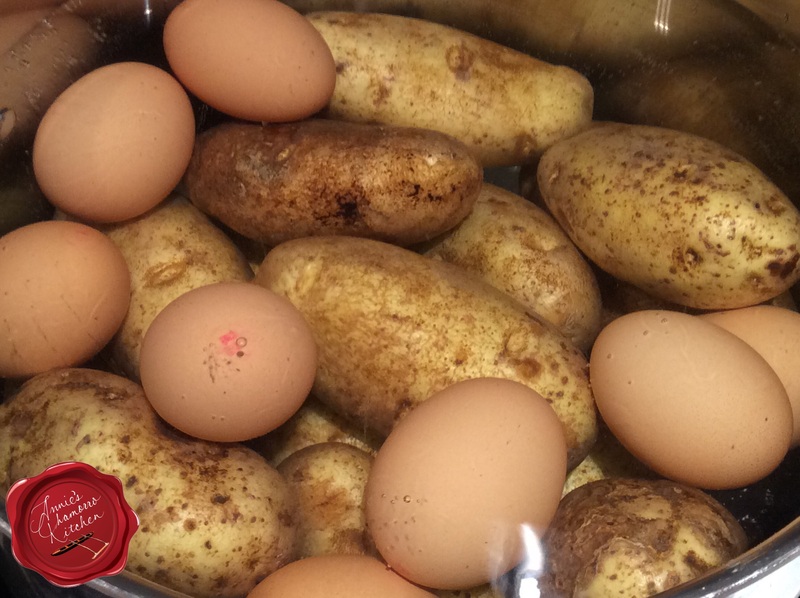 Allow the potatoes and eggs to cool before peeling the skin and shell off. If you want to decorate the top of your salad, set aside one egg yolk. 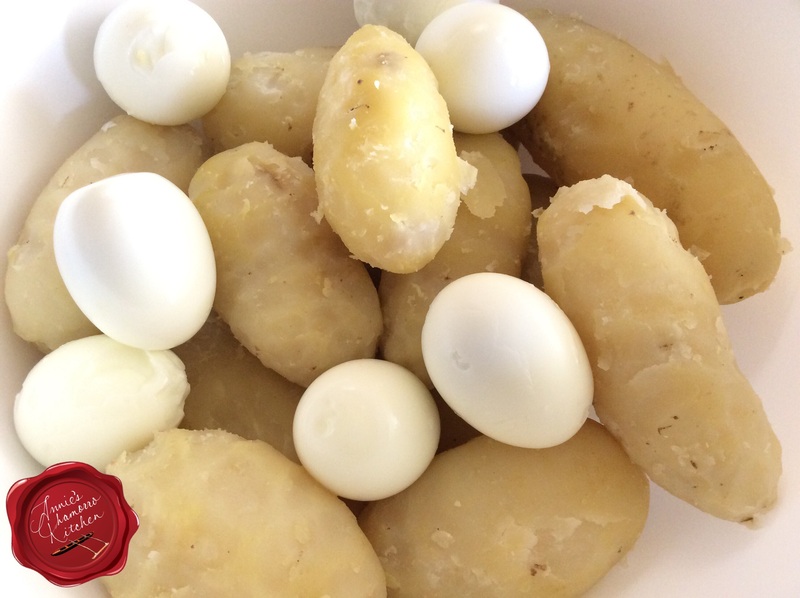 Cut the potatoes and eggs into small cubes. You can make them as big or as small as you like. Don’t cut them too small, however, or you’ll end up with a mashed potato salad. Add the seasonings to the dry mixture — I like adding onion powder, black pepper and salt. The seasonings get distributed easier with the dry potatoes. 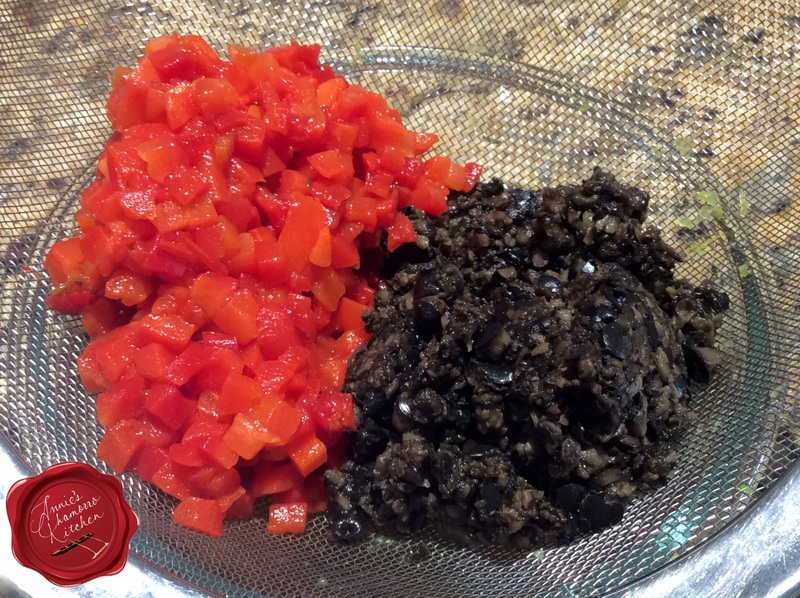 If you add the seasonings after adding the mayo and wet condiments (relish, olives and pimentos), you might get clumps of seasonings that don’t get mixed well. Stir gently to mix the seasonings with the potato-egg mixture. Taste it at this point and add more seasonings to your liking. Don’t add more salt, however. Mayonnaise has salt; wait until you mix the mayo into the salad before adding more salt. Add the relish, olives and pimentos to the bowl. Stir gently to combine. Doesn’t it look so festive already? If you like more olives, relish, and/or pimentos in your salad, by all means, add more. Just be sure to squeeze out as much liquid as you can. Fold in the mayo. 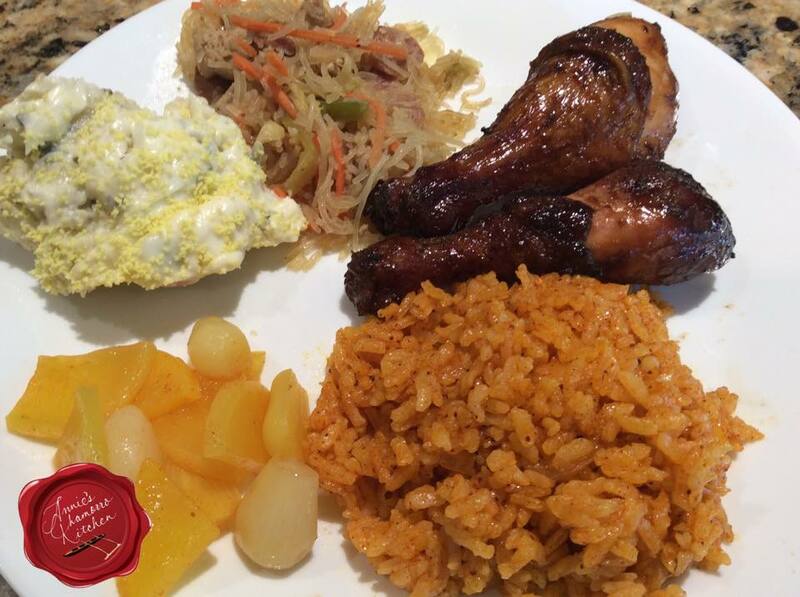 Chamorros will tell you that you MUST use Best Foods or Hellmann’s brand mayonnaise in Chamorro Potato Salad. I must admit that I hold true to that sentiment as well. 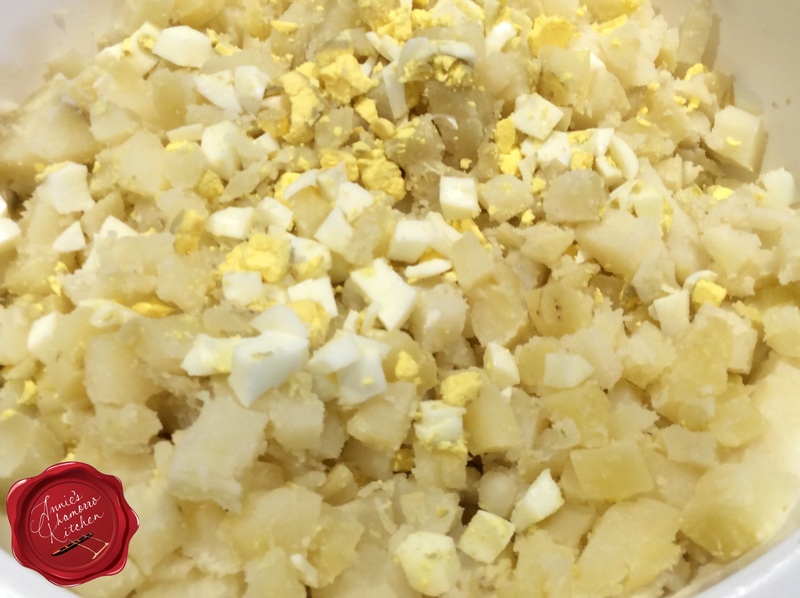 Our classic Chamorro potato salad just doesn’t taste the same if you use “Dressing” (aka Miracle Whip). I like my potato salad a little heavy on the mayo. Use less if you like your salad a bit more on the dry side. 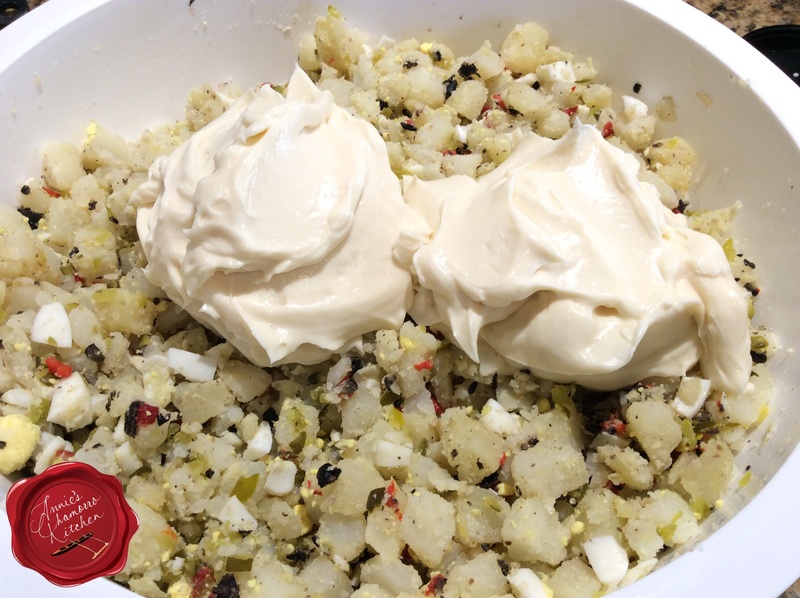 My mom ALWAYS decorated the top of her potato salad, even if we were just eating it at home and not serving it at a party or family gathering. Remember that egg yolk I told you to set aside? Well, it’s time to for it to make its debut. 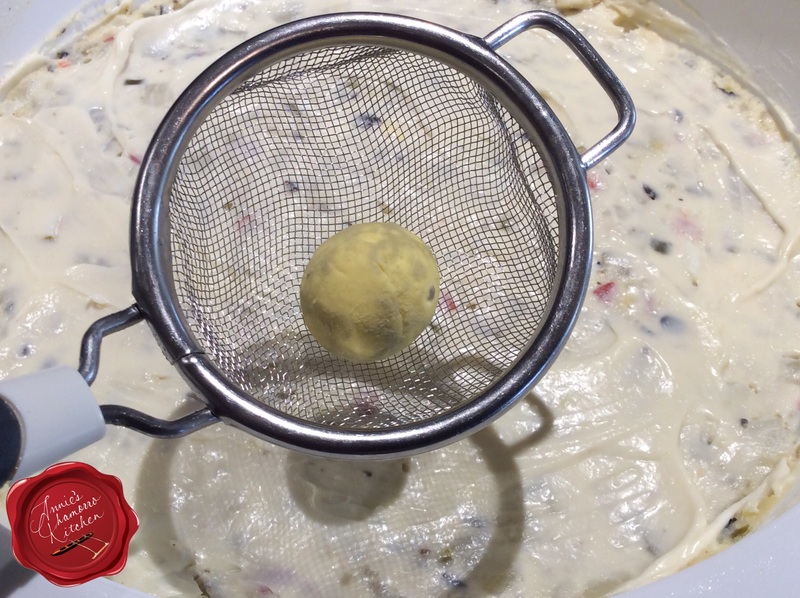 Place the yolk in a small fine-mesh strainer. Oh…wait…before you do anything with the yolk, spread a very thin layer of mayo (a couple of tablespoons should do it) over the top of the salad. This serves as the “canvas” for your egg yolk decoration. 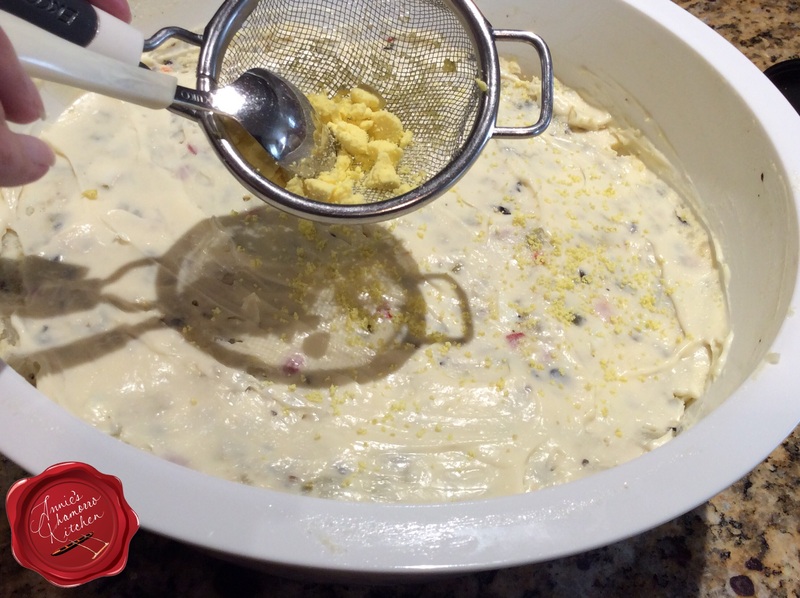 Use a spoon or fork to gently push the yolk through the strainer, creating a “snowfall” of egg yolk over the top of the potato salad. Mom always saved some pimento and olives to make pretty flowers as well, and she’d make flower stems using celery leaves. Be as creative as you like. 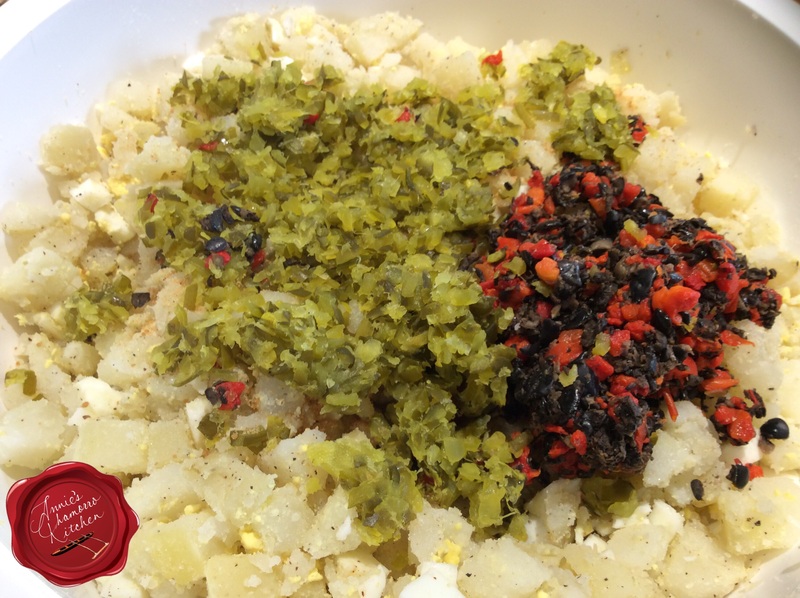 A classic Chamorro side dish that is a must-have on your Fiesta table. 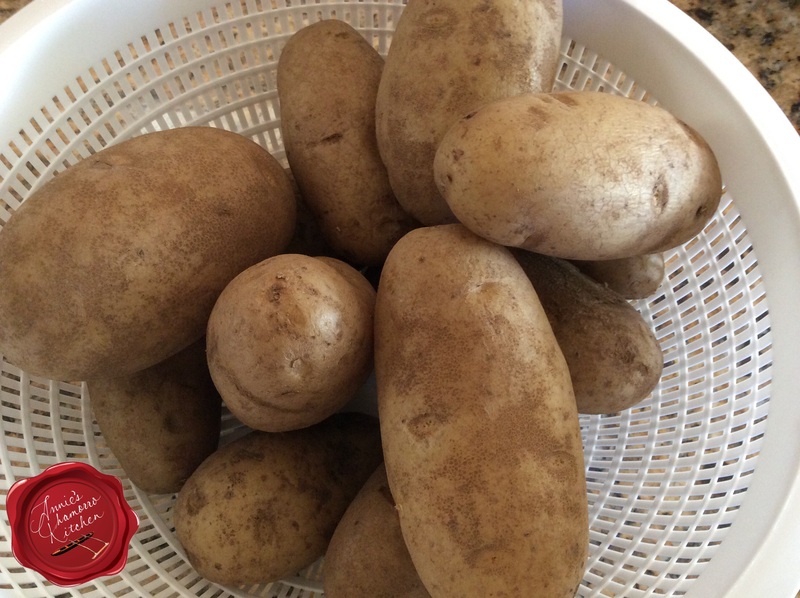 Rinse the potatoes then place in a large pot filled with hot water. Bring the water to a boil. Cook until the potatoes are done (it's done when a knife or fork easily pushes through the potato when pierced). Remove the cooked potatoes from the water; allow to cool completely then peel and discard the potato skin. Cut into small cubes. 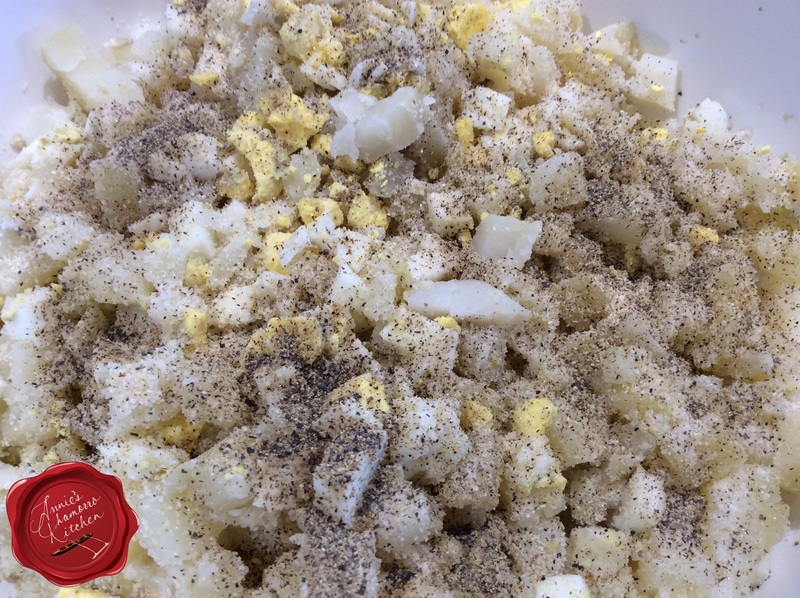 Place the cubed potatoes and diced eggs into a large mixing bowl. Add the onion powder, salt and black pepper. Stir gently to combine. Add the drained and squeezed olives, pimentos and relish to the bowl. Stir to combine. Fold in the mayonnaise. Taste and adjust the seasonings. 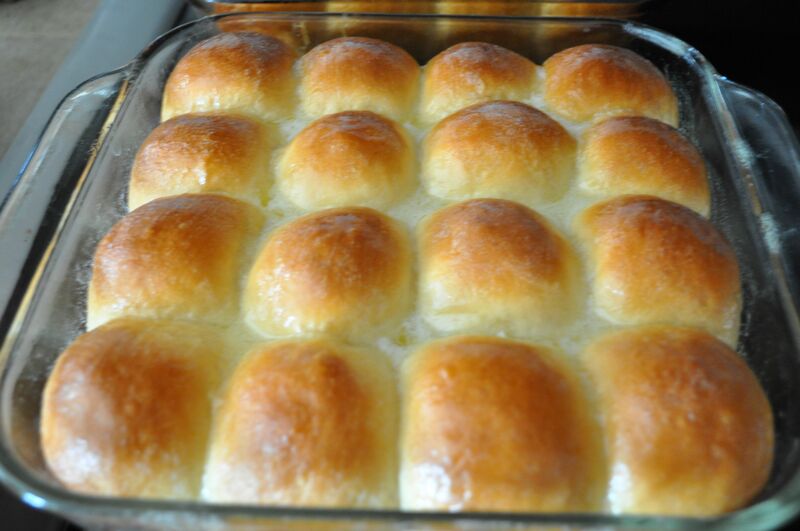 As the title for my recipe states, this is my go-to recipe when I want to whip up a tray of sweet dinner rolls. 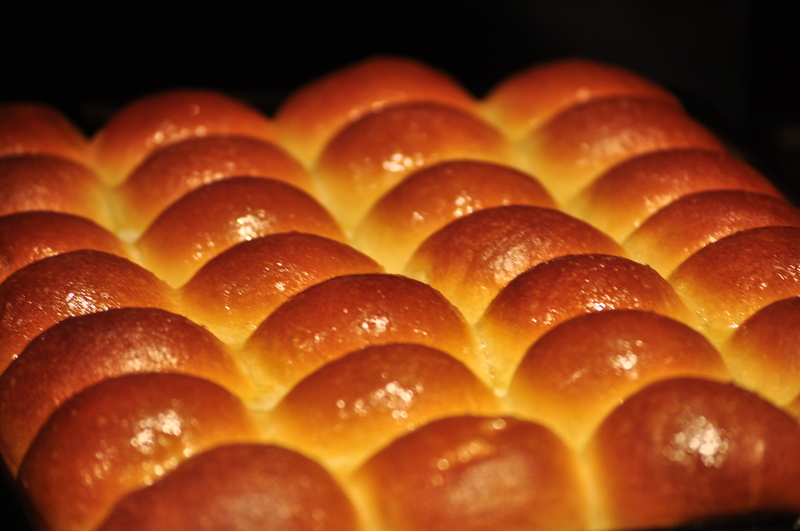 It’s also the same recipe I use in my tutorial videos for making dinner rolls (see below). 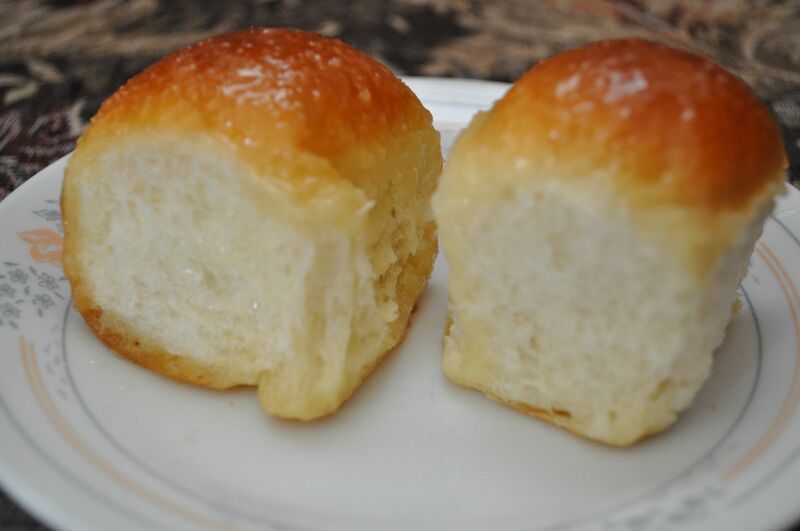 I’ve heard from many people who have made dinner rolls following this recipe and my instructions in my tutorial videos. Most of them were successful at their first try, but I will tell you that baking with yeast requires PATIENCE and practice. If you don’t succeed in your first try, keep at it. 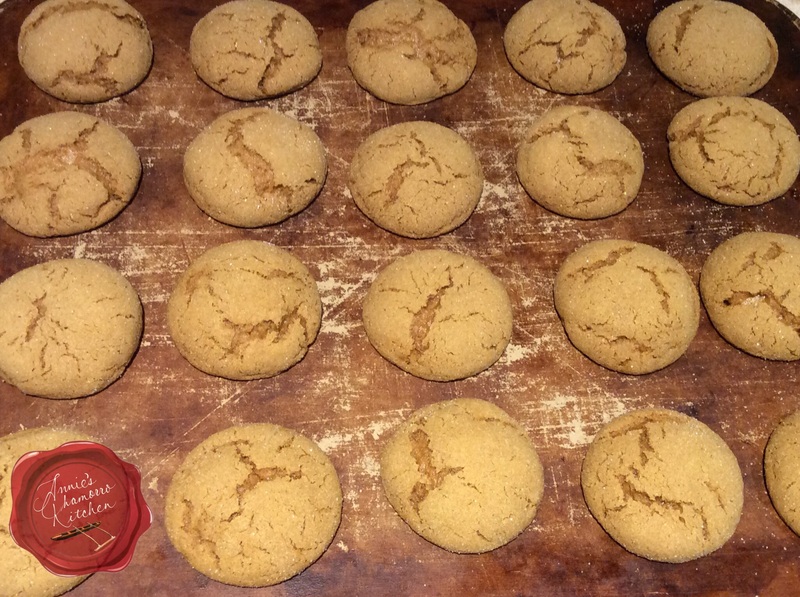 My very first attempt at baking with yeast was an epic failure — my rolls were as hard as rocks! But not anymore! I can’t tell you how much money went down the drain, not to mention the valuable ingredients I wasted each time I tried, but tried I did until I got it right! Sometimes the dough is MEANT to be sticky. Do not be tempted to add a ton of flour just to prevent it from sticking to your hands or you’ll end up with super dense and rock-hard rolls. Instead of adding flour to the dough, flour your hands, or rub a bit of vegetable oil to your hands to prevent the dough from sticking to them. Even if a recipe states to wait about an hour for dough to double in size, sometimes it takes longer depending on the temperature of your rising place. 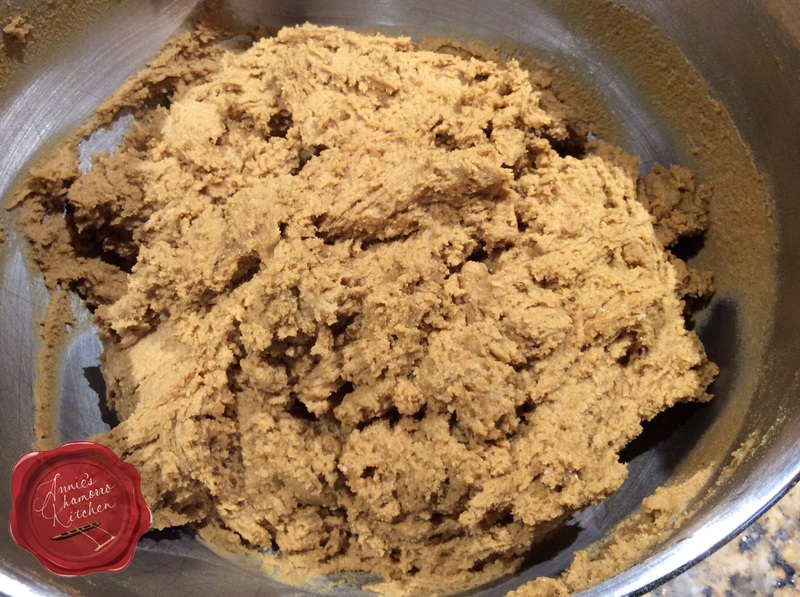 BE PATIENT…the dough will rise and double eventually (provided your yeast is active). Test the temperature of the water (or other liquid) you use to proof your yeast. Use a thermometer if you have one. Otherwise, use your finger to determine whether the liquid is too hot. The perfect yeast-proofing temperature should feel like the temperature of your skin, or a low-grade fever (around 100-101 degrees). Or, for you moms out there, if the temperature feels like it would be too hot to put in a baby’s bottle, then let it cool longer before adding the yeast. Too hot of a temperature will KILL the yeast. Yeast needs sugar to grow. Make sure you add a tablespoon or two of sugar to the proofing liquid. If your yeast doesn’t start to bubble after 5 minutes of proofing, chances are the liquid was too hot (and you killed the yeast), or the yeast was old, or you didn’t add any sugar to feed it. Do not over knead the dough. Hand kneading should take about 10-12 minutes, or 6-8 minutes if using a stand mixer. Give my recipe a try (posted beneath my tutorial videos). 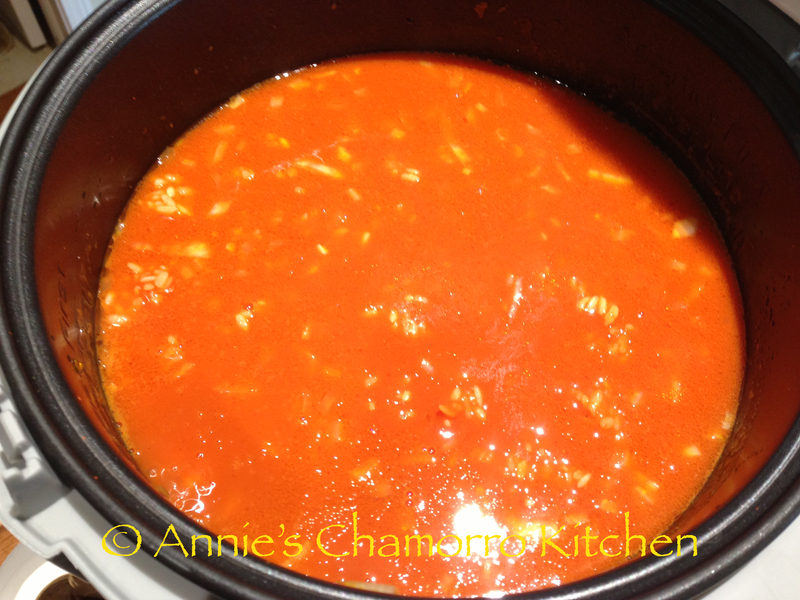 Post any questions in the comment section below, or message me on Facebook at http://www.facebook.com/AnniesChamorroKitchen1/ for a quick response. Good luck, and happy baking! 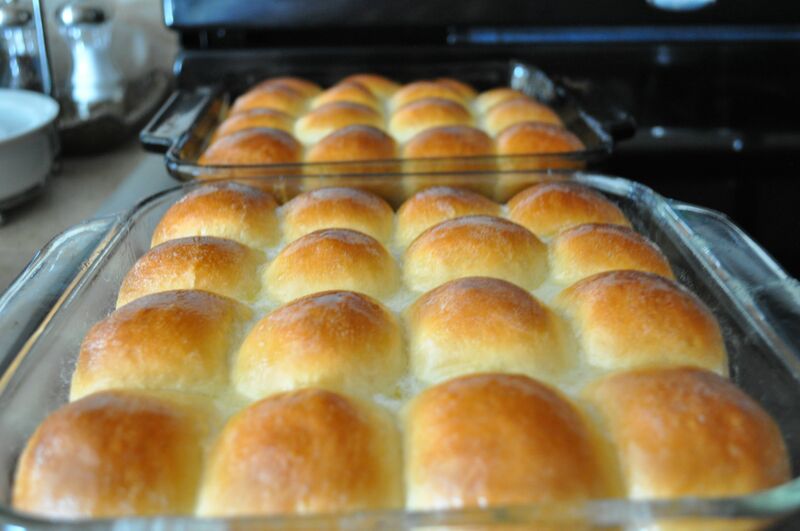 Soft, fluffy and slightly sweet dinner rolls ~ perfect on its own, or slather with sweetened butter for a delicious dessert. In a small bowl, mix together the yeast, 1 teaspoon sugar, and warm water. Stir together to dissolve the sugar and yeast. Let it stand for 5-10 to allow the yeast to proof. Meanwhile, melt together the ¼ cup butter and milk in a microwave. Let it cool slightly. Add some of the cooled milk mixture to the beaten egg (this is to temper the egg so it won't scramble when you add it to the milk mixture). Add the egg to the rest of the milk mixture. After the yeast has proofed for 10 minutes, add the milk- butter-egg mixture to the yeast. Stir to combine. In a stand mixer fitted with a dough hook, mix together 2½ cups of flour, sugar, and salt. Reserve the remaining flour (you might not need it). Pour in the yeast-milk mixture. 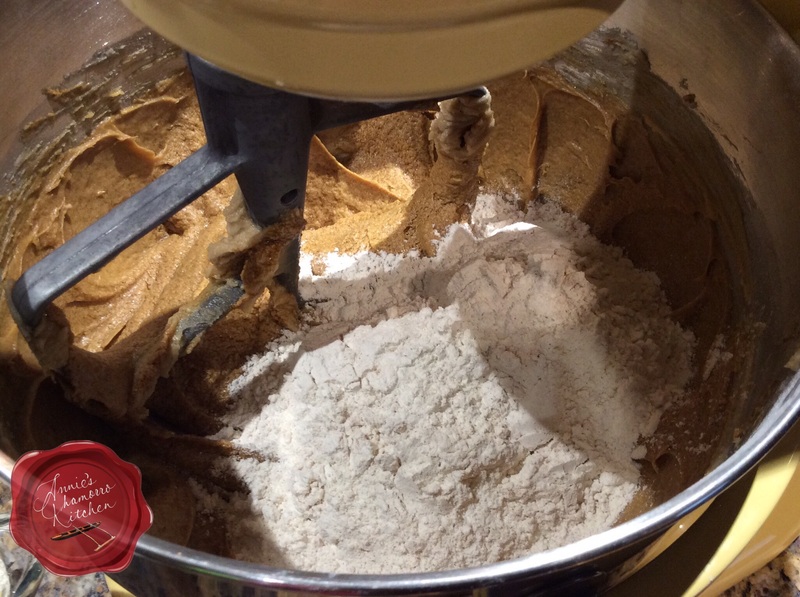 Turn the mixer to medium, mixing until the dough pulls away from the sides. 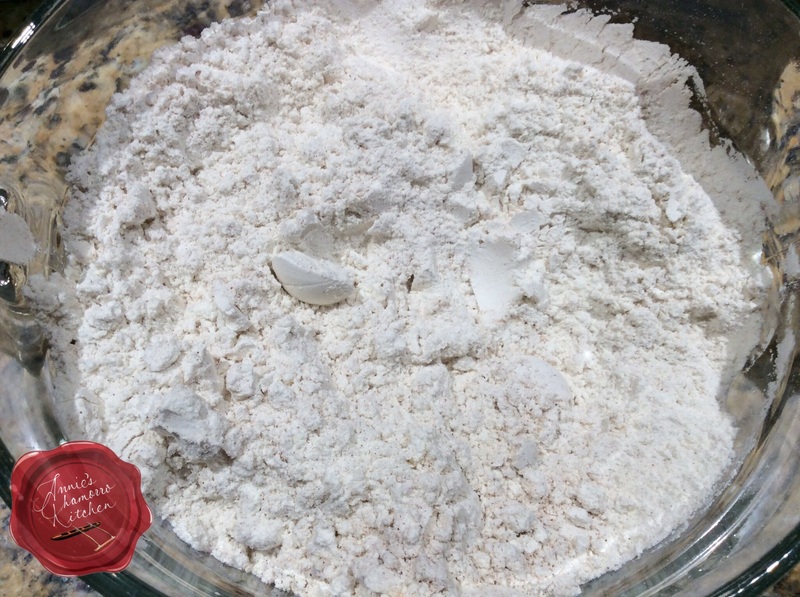 If the dough still looks very sticky and is not pulling away from the side of the mixing bowl, add in more flour, a few spoonfuls at a time until the dough pulls away from the sides of the bowl. (See NOTE below.) 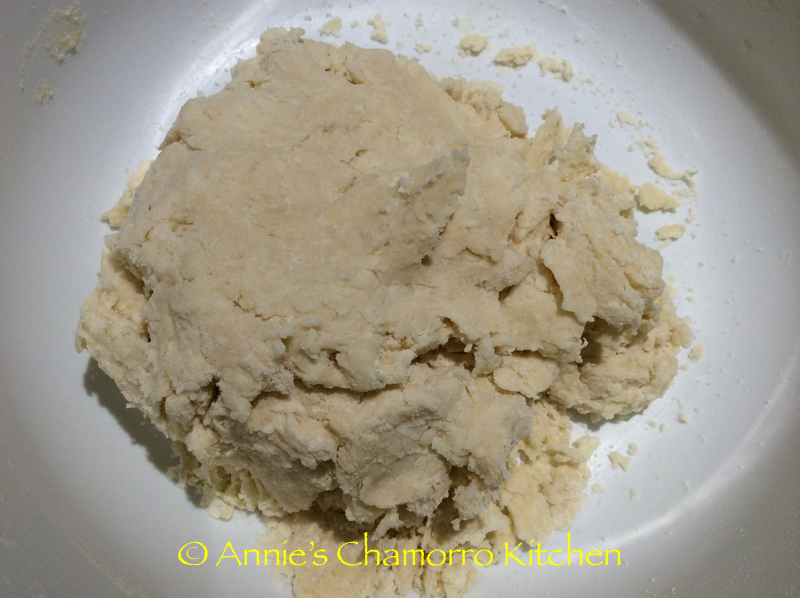 Once the dough pulls away from the sides, turn the mixer to medium high and knead for 5 minutes. After 5 minutes of kneading, remove the dough to a clean and greased bowl (you can use cooking spray). Cover with plastic wrap and place in a warm place to let the dough rise and double in size, about 1 hour. After the dough has doubled, take it out of the bowl and gently punch it down. 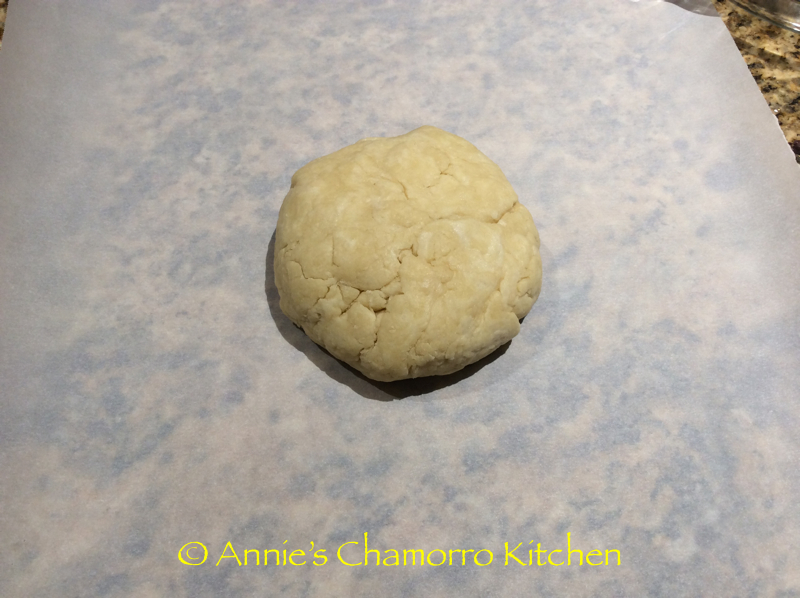 Cut the dough into 28 small pieces then roll them out into balls. 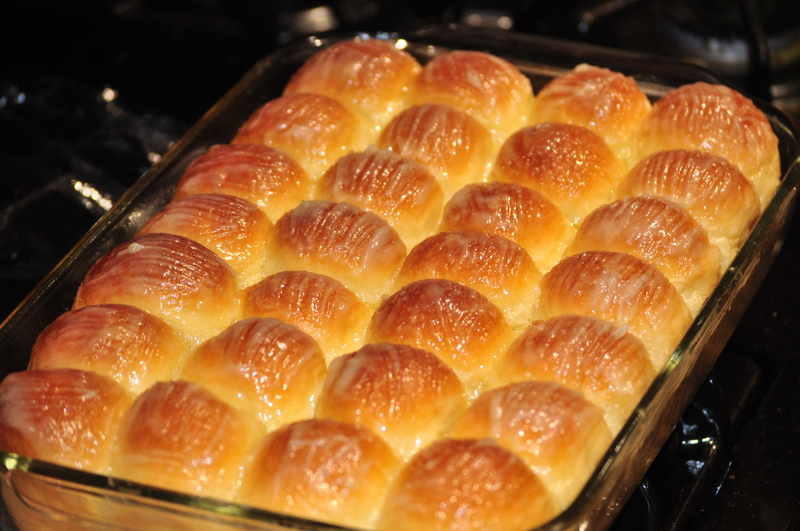 Place the balls of dough in a greased 9x13 pan (7 rolls across and 4 rolls down). Cover with plastic wrap and let it rise again until doubled. 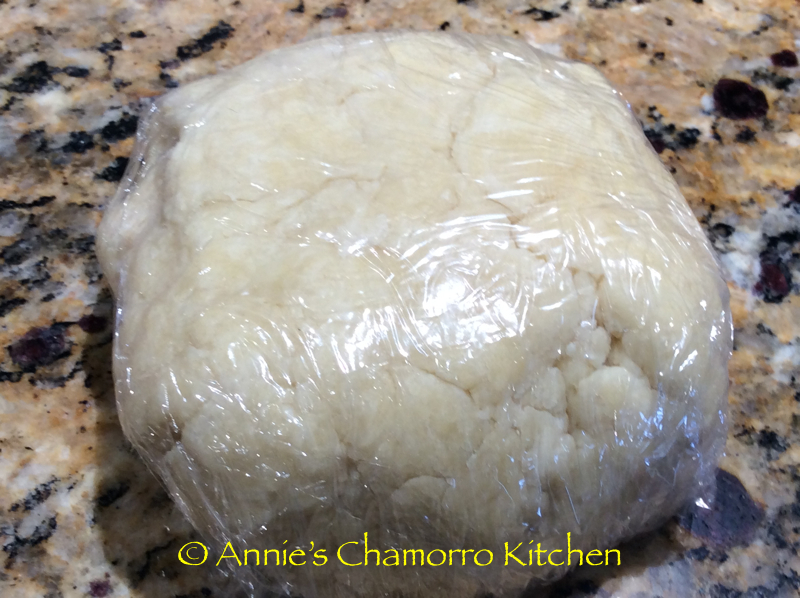 After the rolls have doubled in size, remove the plastic wrap and brush the tops with melted butter. Bake at 375 degrees for 20-25 minutes or until golden brown on top. Remove from the oven and brush with more butter. In most types of yeast bread recipes, the ratio of flour to total liquid should be 3:1. For instance, this recipe calls for just over 1 cup of liquid (including the egg); therefore, use only about 3 c. flour. Start out by mixing in a little less flour than the recipe calls for; If your dough seems too sticky, use only a little more flour just to allow you to knead it, but resist the urge to keep adding flour just so the dough won't stick. Too much flour (and kneading too long and too roughly) will make your finished bread come out tough/hard. 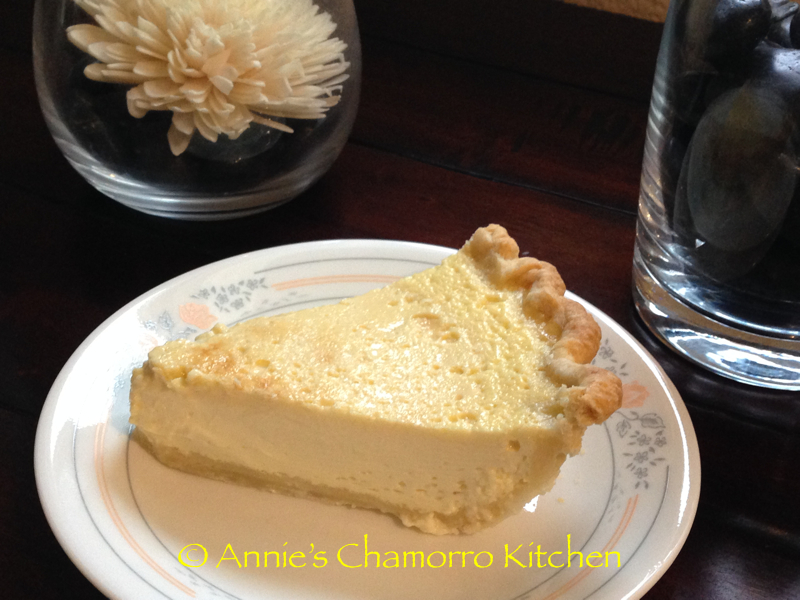 Rich, creamy, sweet and luscious Custard Pie…are you drooling yet? 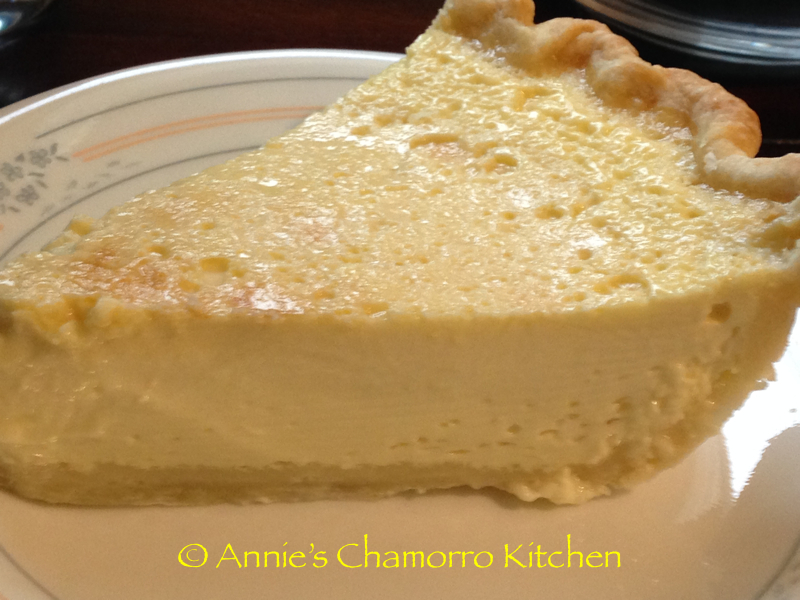 Egg custard pie is so easy to make. Chances are you already have most of the ingredients in your refrigerator and pantry, so why not bake up one of these sweet and creamy pies for your dessert tonight? This is not a pie that is a bake-and-eat option. Because it’s a baked custard, you must let the pie fully set (cool) before serving. 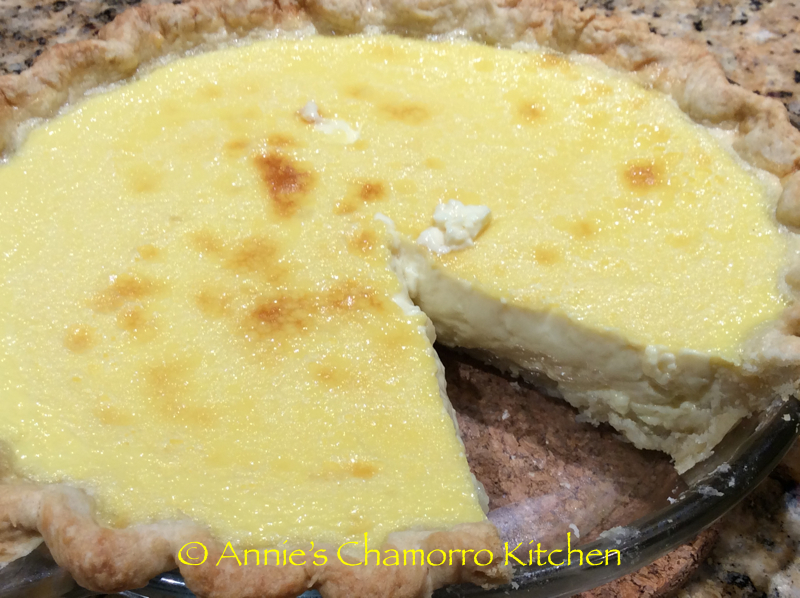 Therefore, if you want this for your dessert after dinner, I advise making this pie in the morning or early afternoon (or even the night before). 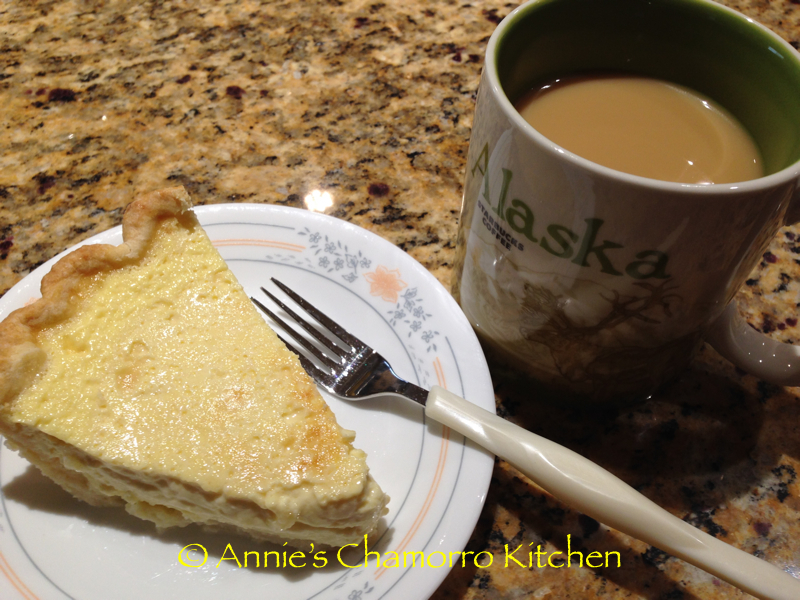 I’ve tried many recipe variations for custard pie, most of which are good, but I wanted a really creamy filling. Some recipes I’ve tried included butter in the custard filling — this is not necessary at all. Other recipes I’ve tried use variations of milk — skim, low-fat, or whole milk. 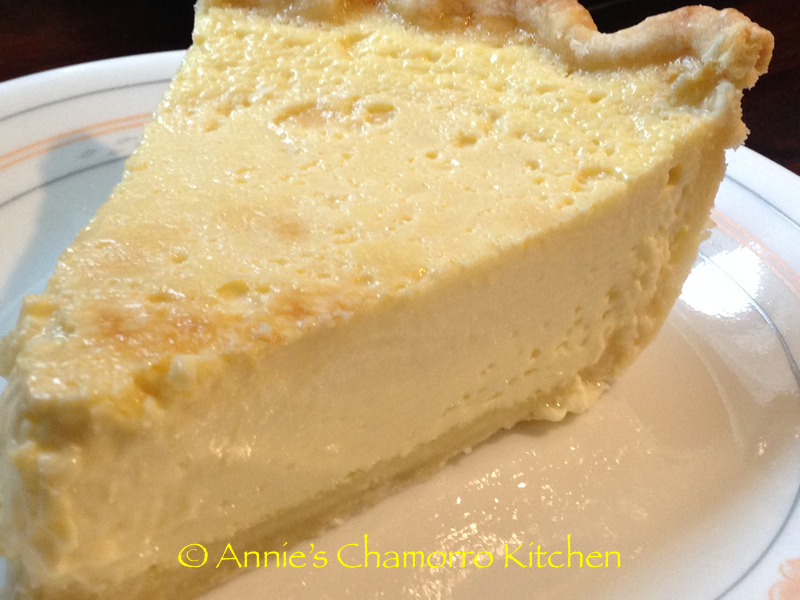 I found that using rich heavy cream or half-and-half makes a custard filling that is out-of-this-world rich and creamy, just what I want in a custard pie! My recipe below uses half-and-half. 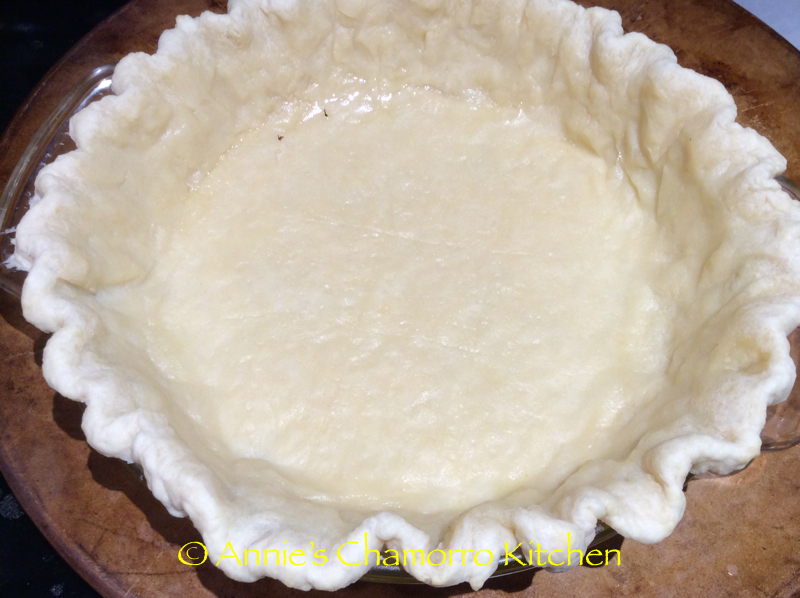 I’ve also used store-bought/ready-made pie crusts before. I am very picky about my pie crusts. Most commercial brands taste too bland for me. 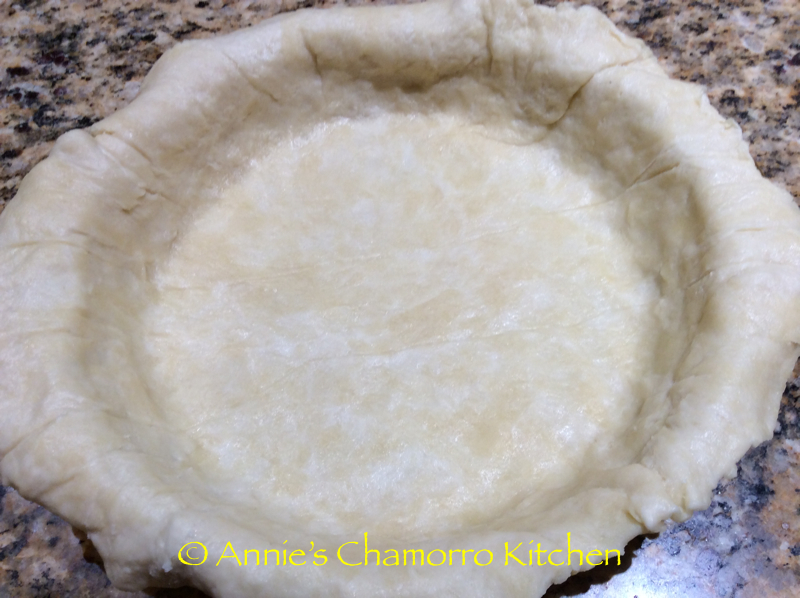 It’s so easy to make homemade pie crusts, so why buy the pre-made stuff? 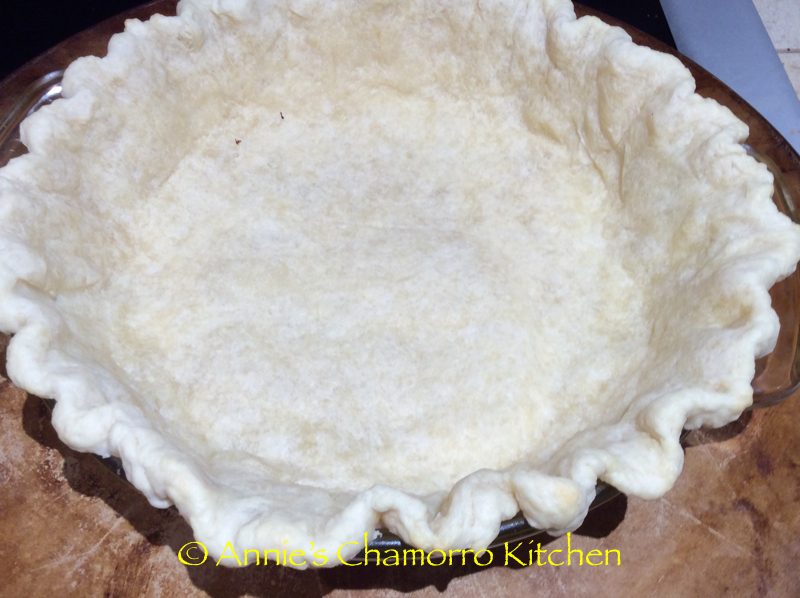 I include a recipe for homemade pie crust as well. Give it a try, but if you prefer the packaged kind, I recommend you still pre-bake (also called blind-baking) the crust before baking the custard. One note about the pie crust and filling — my recipe below makes enough for one DEEP-DISH, 9-inch pie. Make sure you use a deep dish pie plate (or buy a deep dish pie crust) when making this recipe or you’ll have leftover pie dough and filling that you’ll end up throwing out (it would be a shame to waste your ingredients). 1. In a large mixing bowl, place the flour, sugar, salt, and butter. 2. Stir the ingredients together briefly, just enough to mix the flour, sugar and salt together. 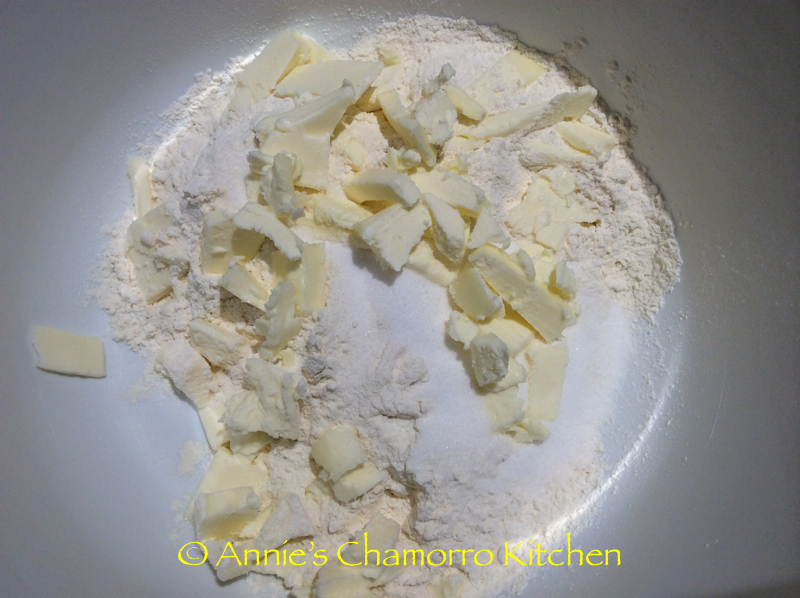 Use a dough cutter (or you can use a food processor) to “cut” the butter into the flour. You want to see very small pieces of butter (about the size of a pea). 3. 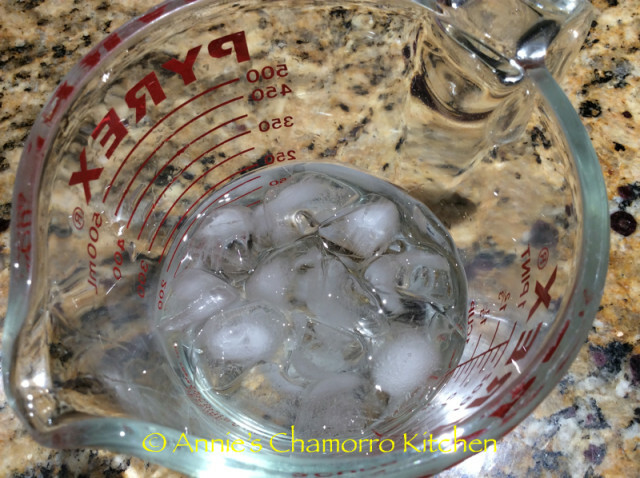 Pour the ice water over the flour mixture, starting with 1/4 cup of ice water. 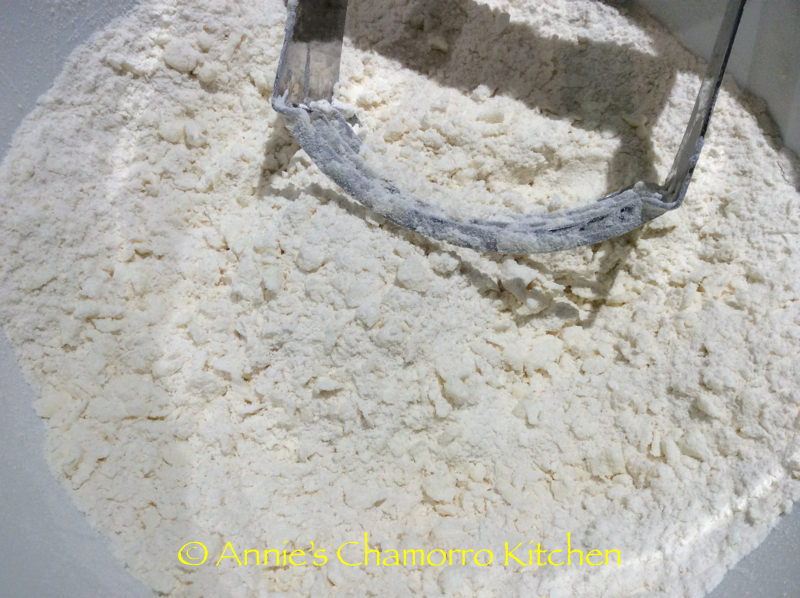 Gently mix the water into the flour, forming a shaggy, loose dough. Add more water, a spoonful at a time, until the dough comes together. You should not need more than 1/2 cup of ice water. This is what it looks like after the initial mixing of water and flour. You can still see some dry bits at the bottom of the bowl, but this is the perfect consistency — you do not need any more water at this point. Give it another minute or so of kneading and the dough will come together. 4. Wrap the dough in plastic wrap and place in the refrigerator to rest for at least 15 minutes. I actually place my dough in the freezer. Don’t worry — the dough won’t freeze solid. The goal is to get the butter very cold again (since the butter softened during the mixing process). 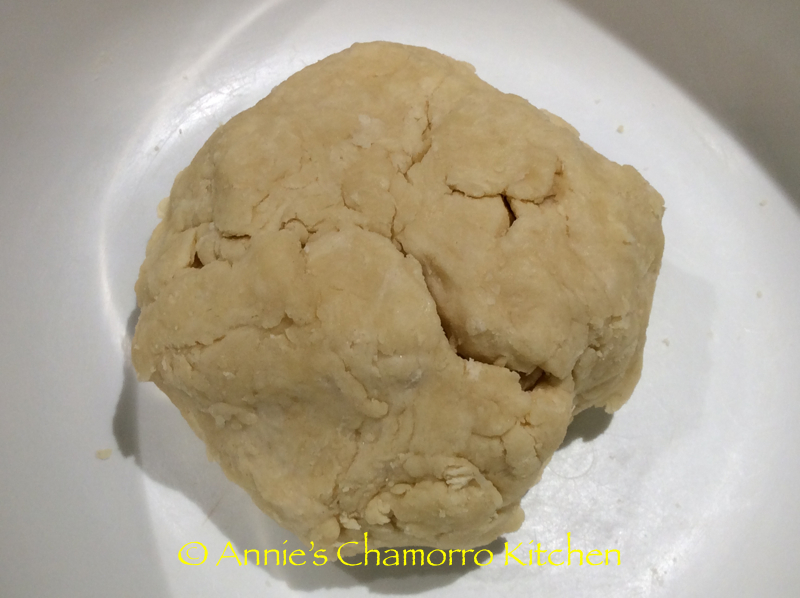 You want to still see chunks of butter when you roll out the dough and eventually bake it. During the baking process, the melting butter creates steam, which is what makes your dough nice and flaky. 5. After 15 minutes, remove the dough from the refrigerator (or freezer). Place the dough between two large sheets of parchment paper. 6. Roll the dough into a circle, about 1/8 inch thick and two inches larger in diameter than the width of your pie pan. 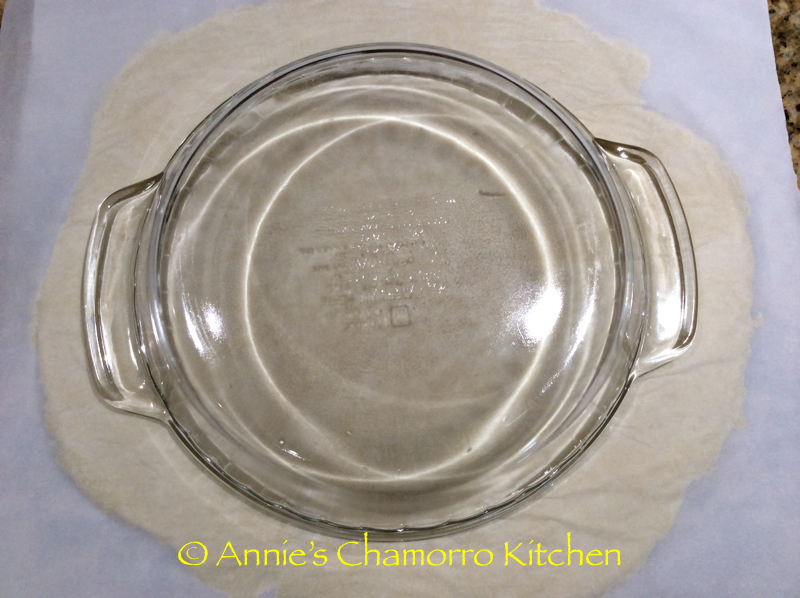 Turn the pie pan upside down on top of the parchment paper to measure. 7. 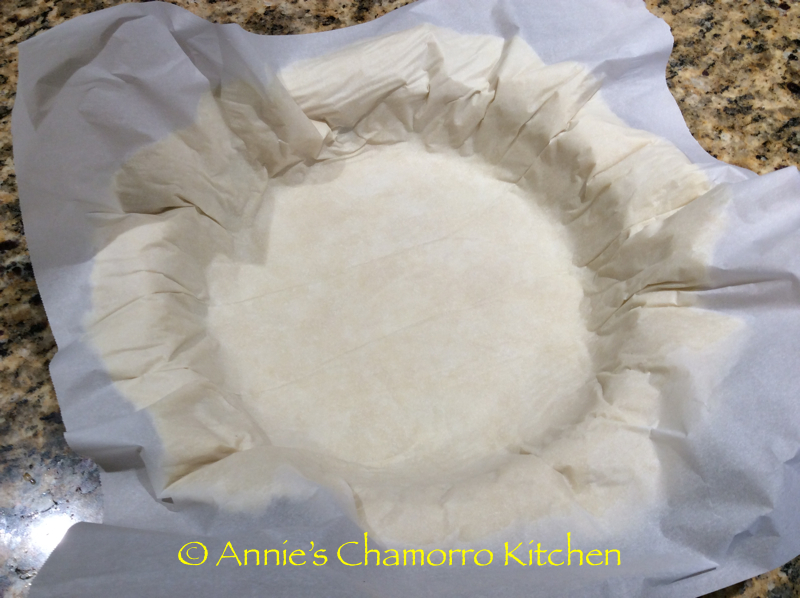 To place the dough in the pie pan, remove one sheet of parchment paper. Turn the pie pan upside down over the dough. Carefully slide your hand beneath the parchment paper and flip the dough and pie pan right-side-up. Gently push the dough down into the pie pan. 8. Carefully peel the parchment paper off the dough (save the paper for use later). Push the dough into the sides of the pan (and pinch the dough to close any holes), if necessary. 9. Trim off some of the dough around the edge, leaving a little bit of dough hanging over the side. Use whatever method you like to flute the edge of the dough. I just use my fingertips to create a fluted edge like you see below. 10. It’s time to blind-bake the pie crust. Pre-heat your oven to 425 degrees. Place one sheet of parchment paper inside the pie pan. Place the dried beans over the parchment paper. 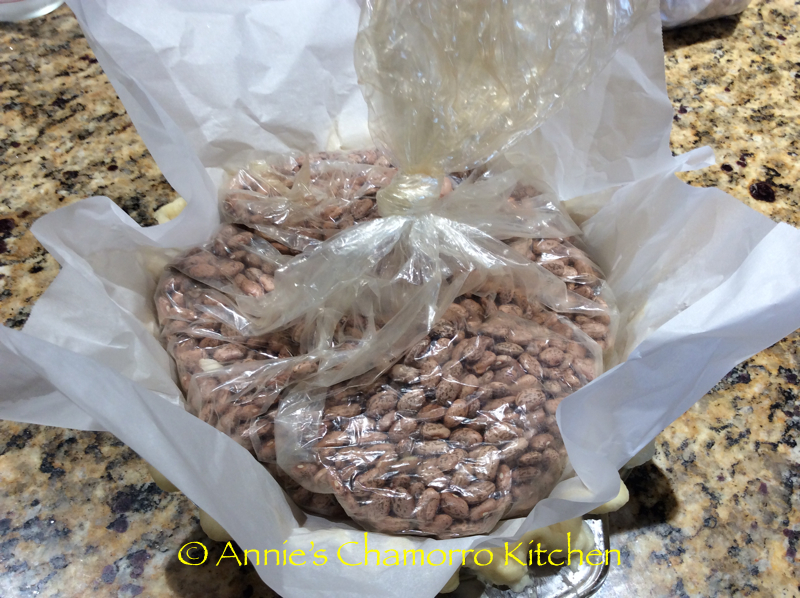 I like to place my dried beans in oven cooking bags; this way I can reuse the beans the next time I bake a pie. 11. Bake the pie crust for 15 minutes then remove it from the oven. Remove the beans and parchment paper and return the pie crust to the oven to bake for 5 more minutes. 12. 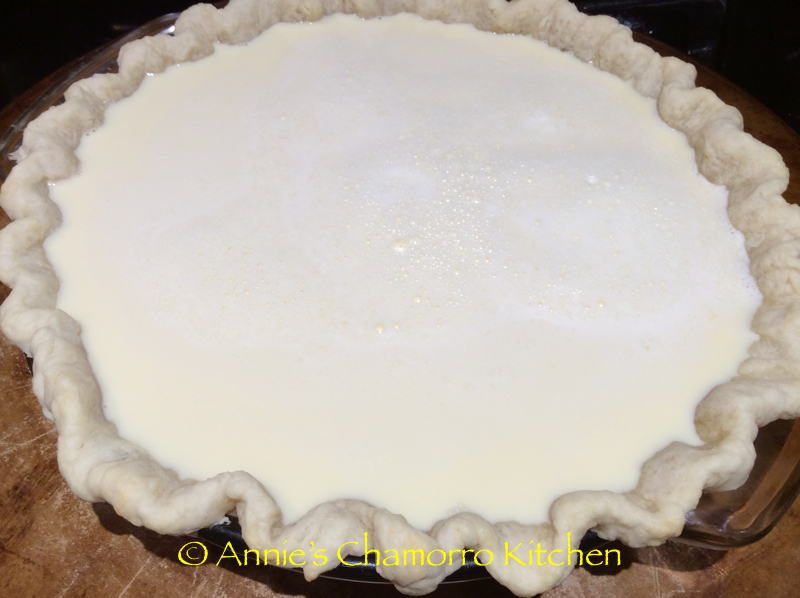 During the last 5 minutes of baking, the bottom of the pie crust will very likely bubble up. Do not panic. After you remove the crust from the oven, immediately (but very gently) push down on the bubble to release the steam. The bottom of the pie crust will flatten again once all of the steam is released. 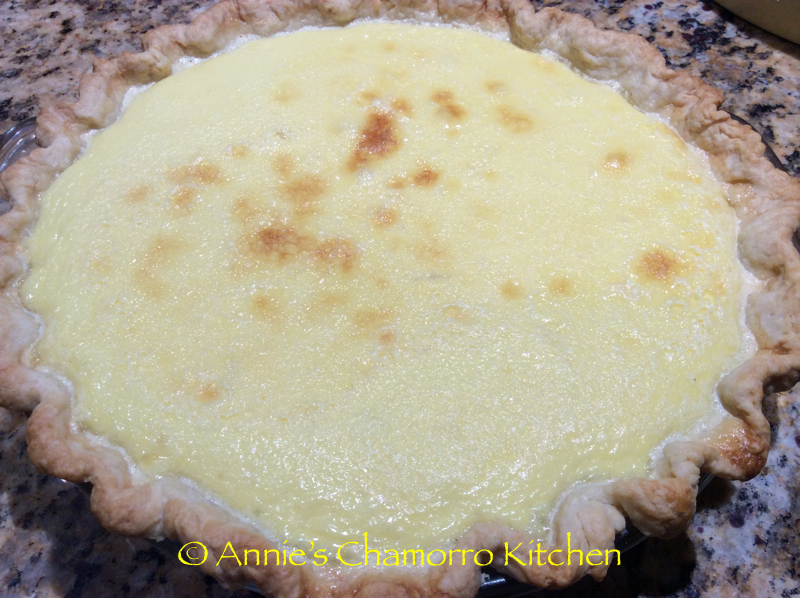 Set the pre-baked crust aside while you prepare the custard filling. 1. Decrease your oven temperature to 350 degrees. In a small mixing bowl, place the sugar, eggs, vanilla extract and salt. 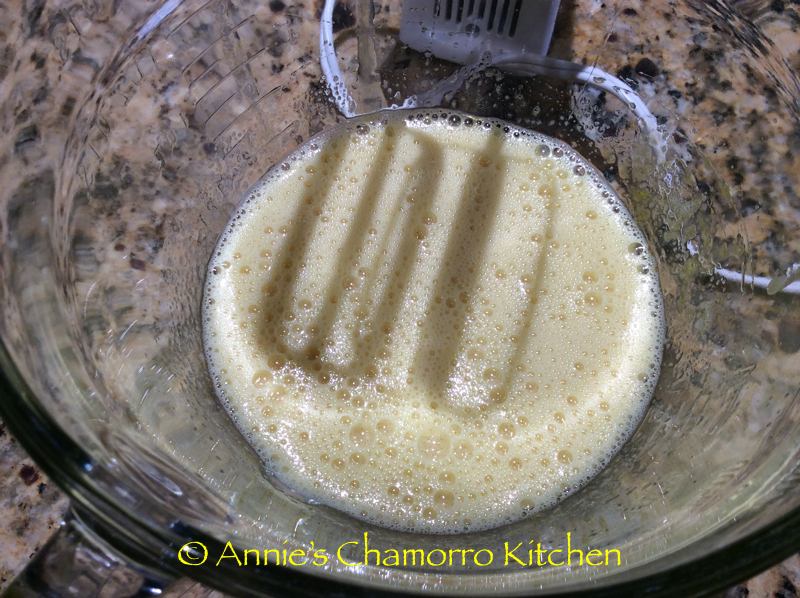 Use a hand mixer on low speed (or a whisk) to mix the ingredients together; mix for a couple of minutes only. 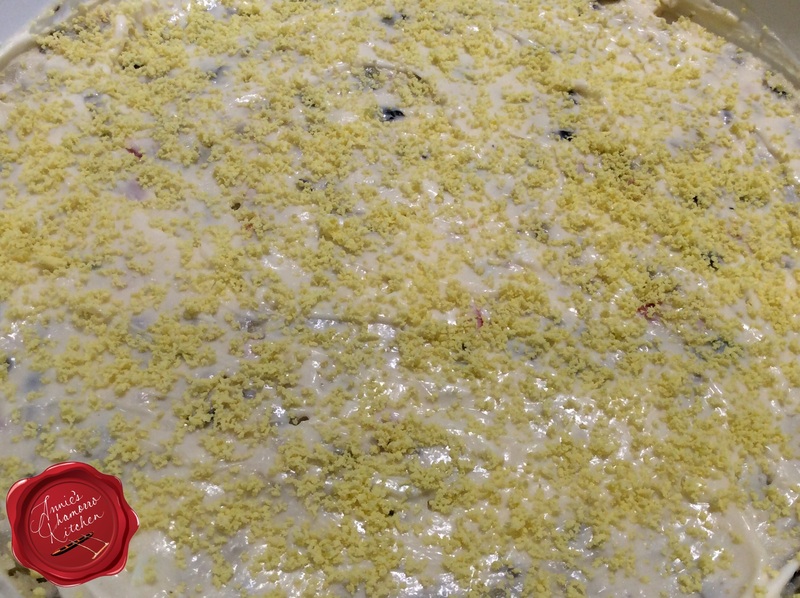 Do not over-mix or your resulting custard will turn out grainy. 2. In a separate microwave-safe bowl, heat the half-and-half in the microwave on high for two minutes. Mix the hot half-and-half — 1/2 cup at a time — into the egg mixture. DO NOT add the hot liquid all at once or you will end up scrambling your egg mixture! Adding the hot liquid a little at a time tempers the egg mixture. Continue mixing in the hot liquid, a little at a time, until all the liquid is mixed with the egg mixture. 1. Place your oven rack in the bottom half of your oven. Place a baking pan in the oven, then place the un-filled and pre-baked pie crust on top of the baking pan. 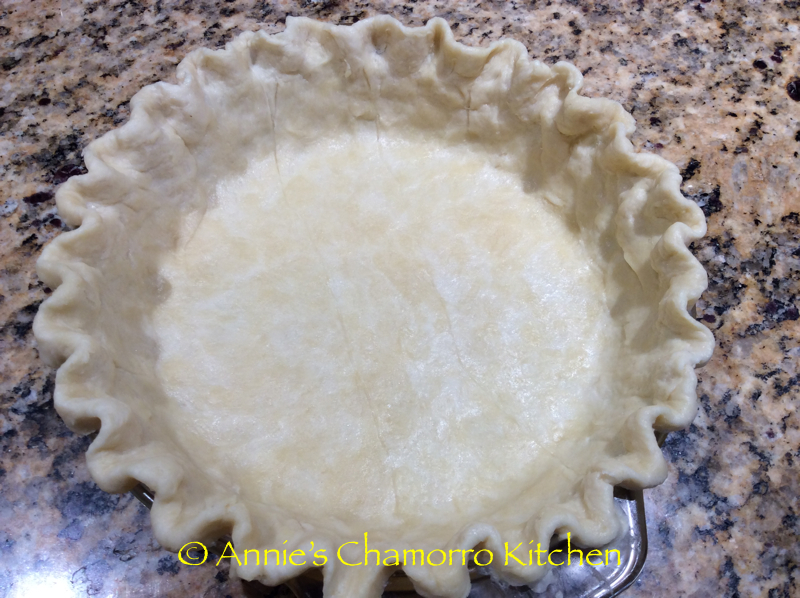 Carefully pour the filling mixture into the pie crust. Be careful not to touch the hot oven with your arms or hands as you pour the liquid into the pie crust. 2. Bake the pie for a total of 50 minutes. After 40 minutes, if you need to, wrap a piece of foil (or use a pie shield) around the edge of the pie (to prevent the crust from burning or browning too much). Bake for 10 more minutes then remove the pie from the oven. The pie will be jiggly still when you take it out of the oven. It will look something like jello, with the top surface of the pie rippling as you gently shake it. You may think the pie is under-cooked, but TRUST ME, it is DONE. Resist the urge to bake it longer. 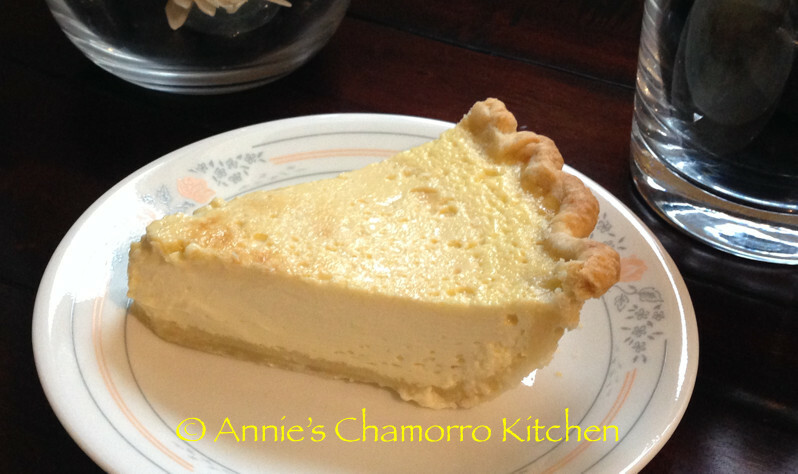 You really don’t want to over-bake custard pies. 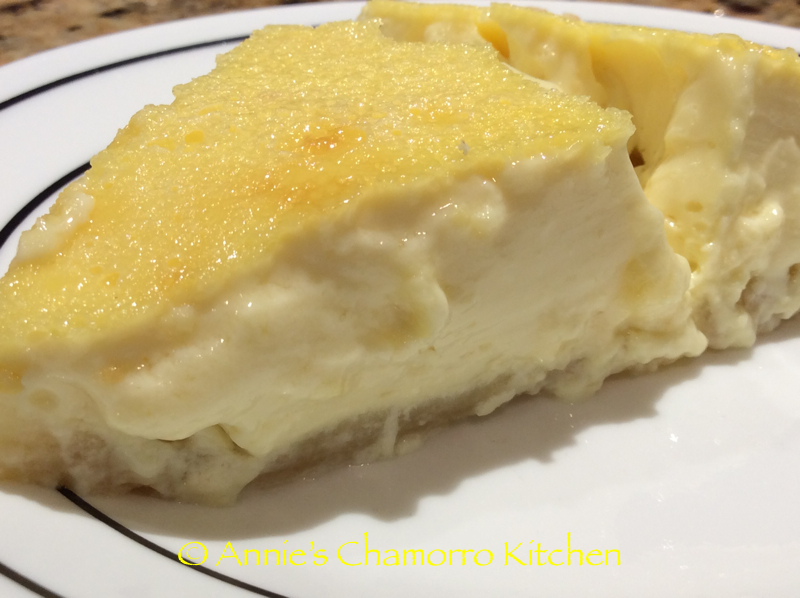 Have you ever had custard pies that tasted way too much like eggs? That’s due to OVER-BAKING the custard — a real no-no. 3. Now comes the hard part. You MUST let the pie cool at room temperature for at least 2 or 3 hours before cutting into it. As the pie cools, the filling is still “cooking.” The pie will set (firm up) once completely cooled. Ideally, after cooling at room temperature for a few hours, you want to refrigerate the pie another hour or so to finish cooling and allow the pie to set fully. As you can see, the pie is mostly set at this point, but another hour or longer of cooling in the refrigerator will be better. This is the pie after cooling in the refrigerator overnight. Make sure the pie is completely cooled at room temperature before placing in the refrigerator or else condensation will collect on the top of the pie as it cools in the fridge. If that happens, don’t worry — just use a paper towel to soak up any accumulated condensation on top of the pie. This makes the BEST breakfast! Serve up a slice — or two — and ENJOY! 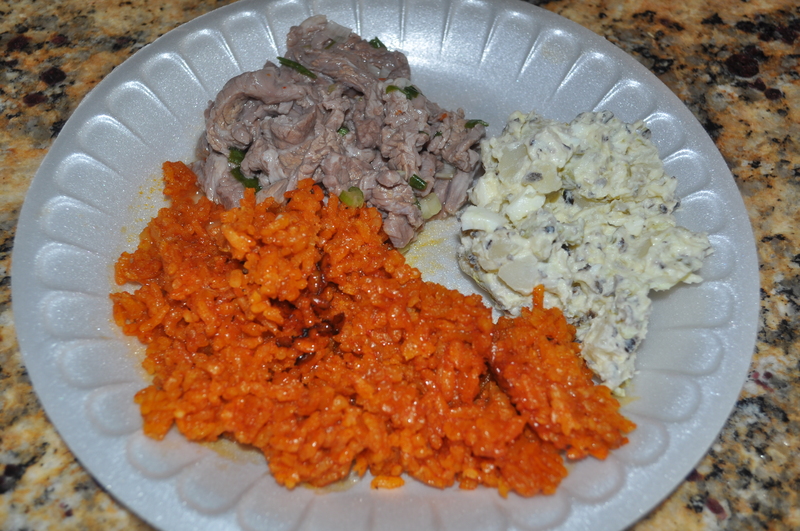 Red Rice is a must-have for any Chamorro Fiesta menu. 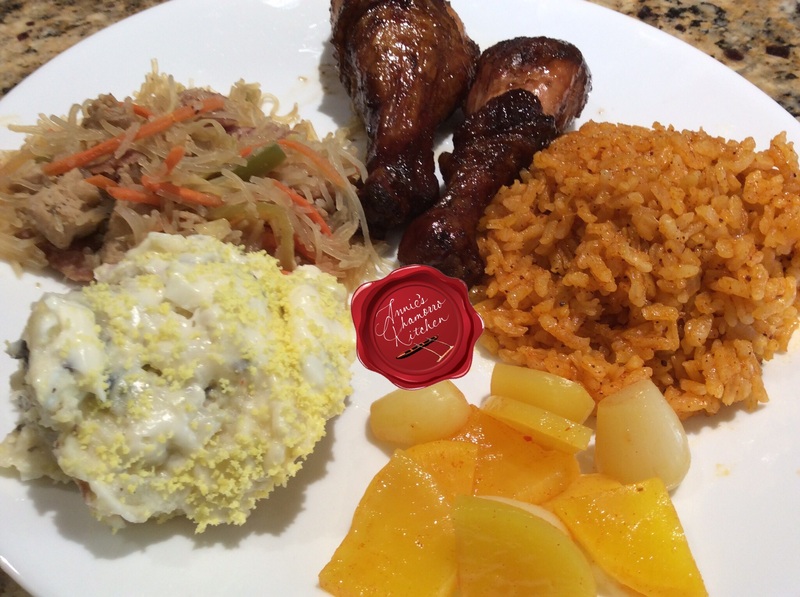 Without red rice, it just won’t seem much like a fiesta. Some people add peas to their red rice, but I like mine without it. 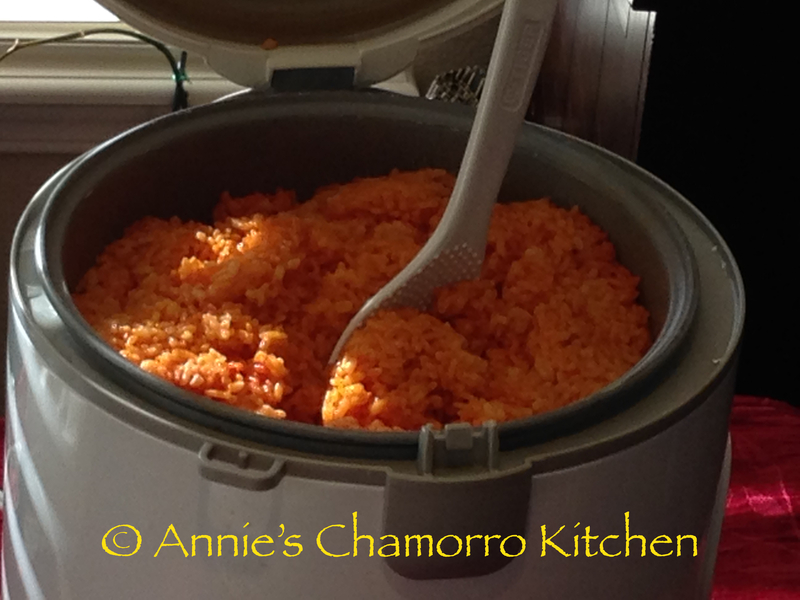 Serve some Chamorro Red Rice at your next gathering for that extra special touch. You can use achote water made with achote seeds instead of using powdered achote. Scrub about 1/4 cup of achote seeds in 3 1/2 cups warm water. Add the achote water (make sure to strain out the seeds and add just the achote water) to the pot where the directions call for adding water and achote powder. 1. Place the rice into your rice cooker pot. 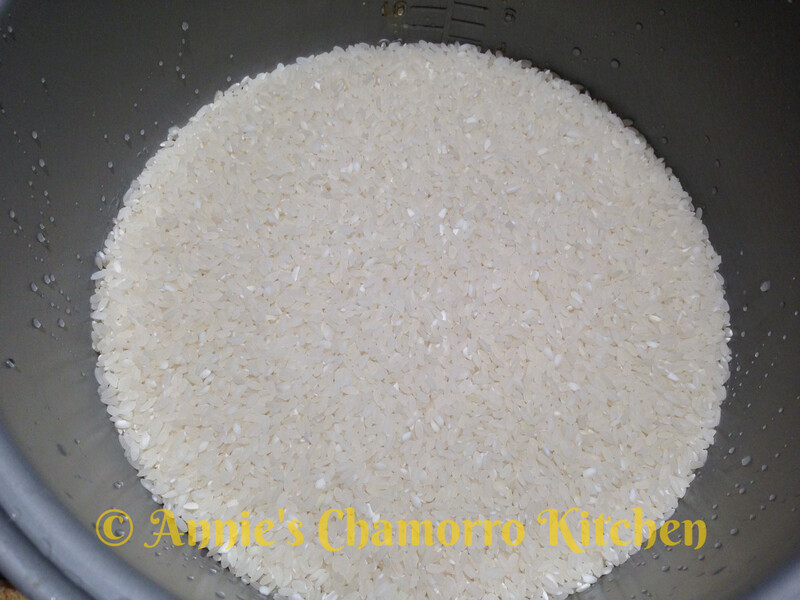 Rinse the rice as required, draining out any excess water. 2. Into the pot, add the Dashida, bacon fat, black pepper, garlic, and achote powder. If you don’t have any saved bacon fat, substitute with olive or vegetable oil. 3. Add the green onions to the pot. 4. Carefully pour the hot water into the pot. 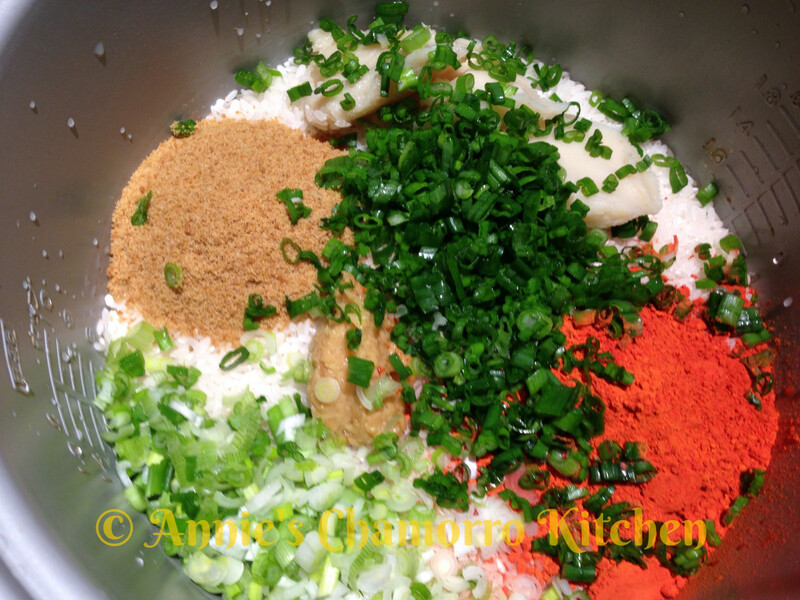 Stir to combine all the ingredients and to dissolve the achote powder and Dashida. The bacon fat will start to melt; don’t worry if it doesn’t completely melt at this time. Turn the rice cooker to the “cook” setting. The only thing left to do is to stir the rice a couple more times. Wait a couple of minutes then stir to ensure even mixing after the bacon fat melted. Wait another 5 minutes or so and stir once more to ensure the rice at the bottom of the pot is evenly coated with achote coloring. 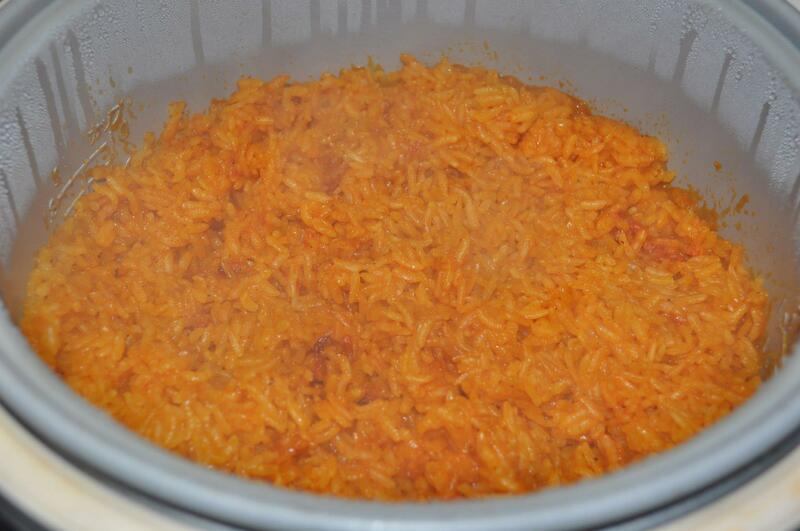 After stirring the rice for a second time, leave the rice to cook/steam until done.